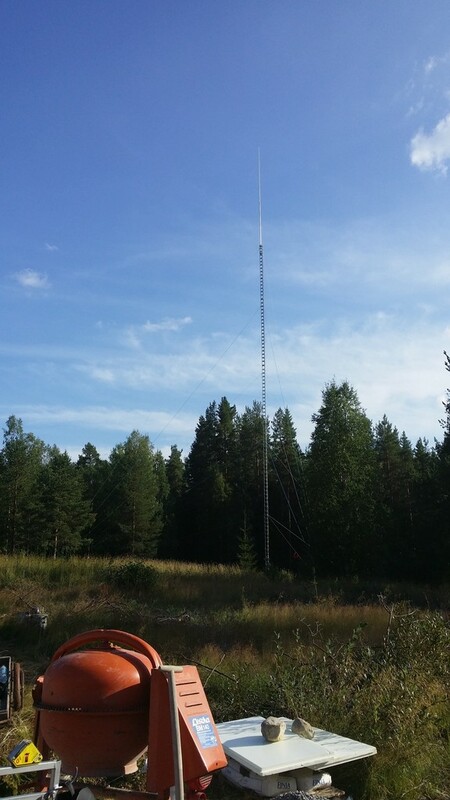 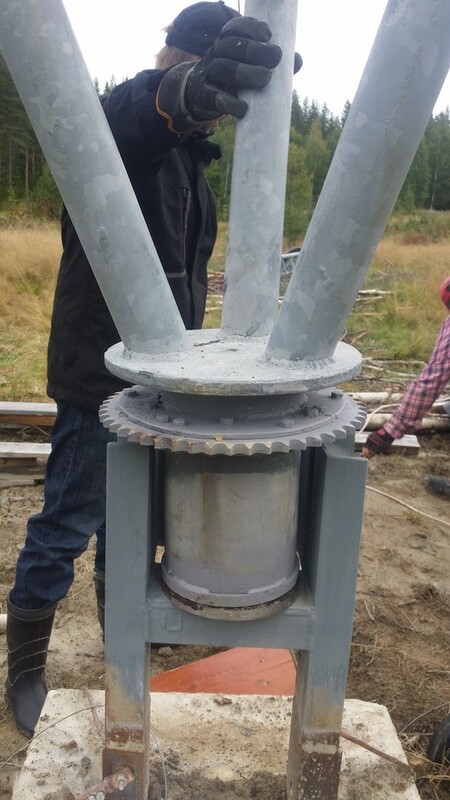 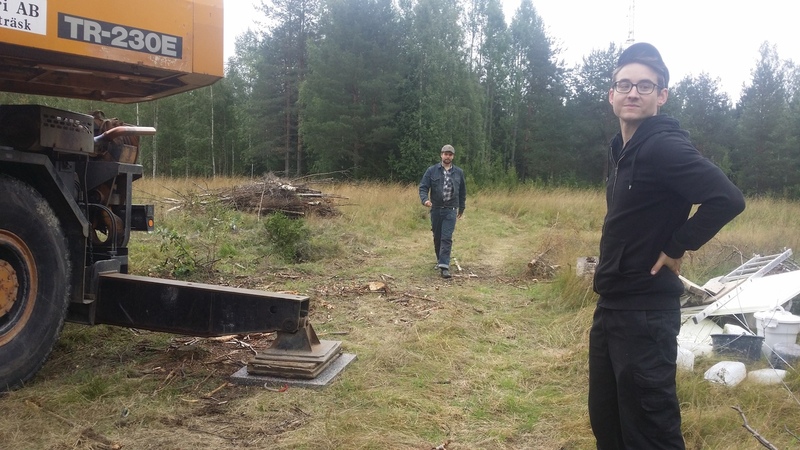 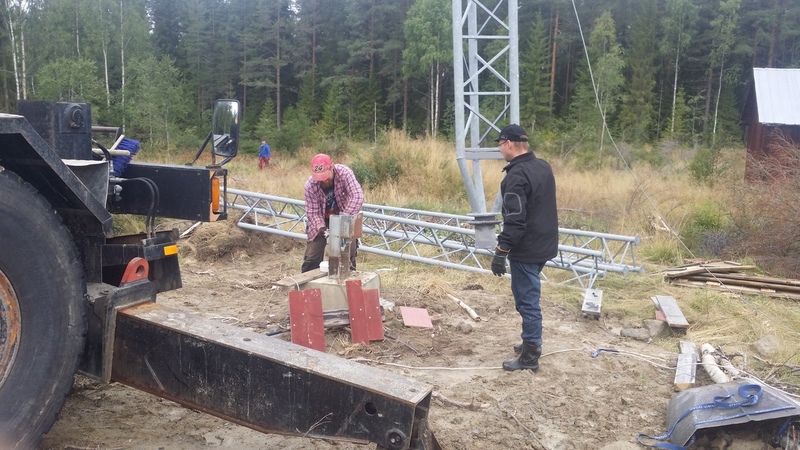 This weekend we had planned to lift the first 36m of the 60m high Moskojärvi tower. 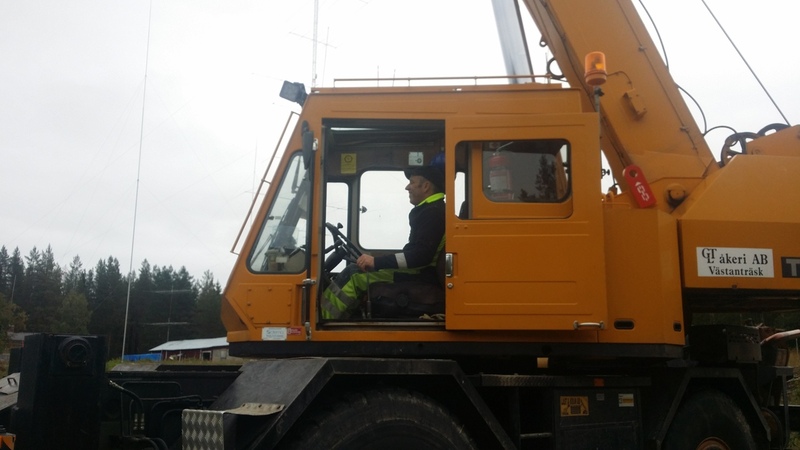 It all went great and as usual “GTL-Tobbe” did the job great with the small village crane. 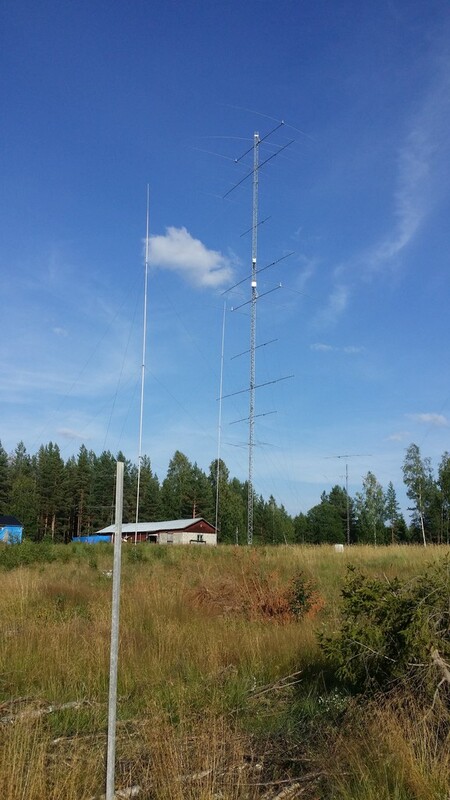 It was fun to have the new local hams with us for the first time during a tower lift, SA2CHQ and SA2CLC who live very close to SJ2W. 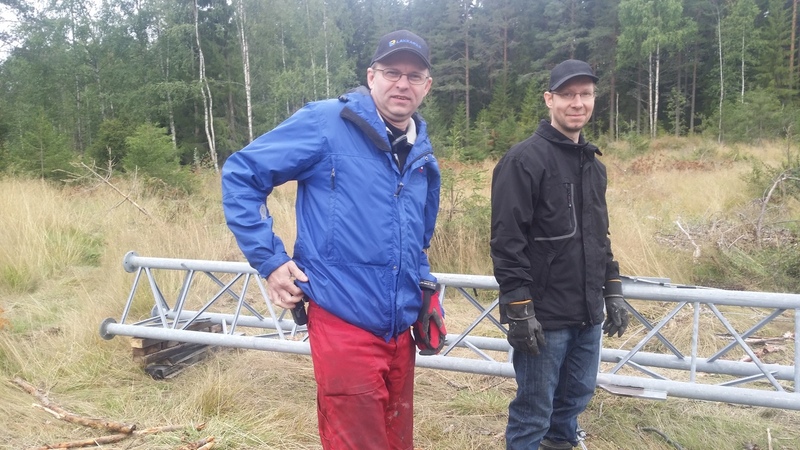 SM2XLL also brought his friend Ulrik who was a big asset as well. 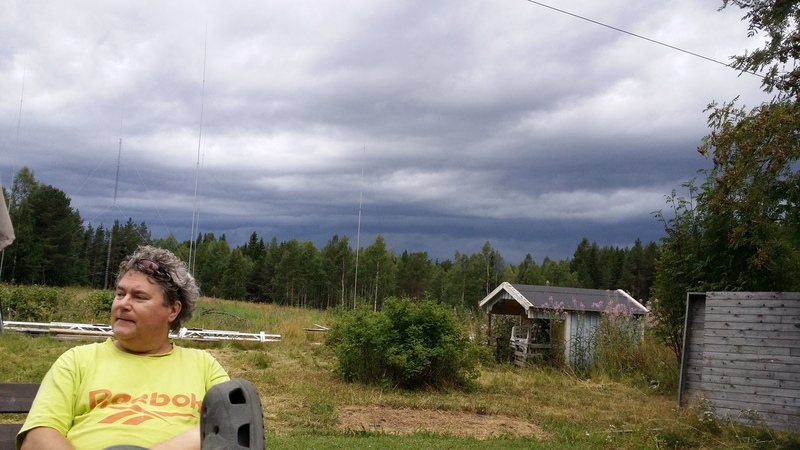 I got a ride with SM2UVU who had been up in Kiruna for work and when we arrived at SJ2W Pelle, SM2LIY was already there. 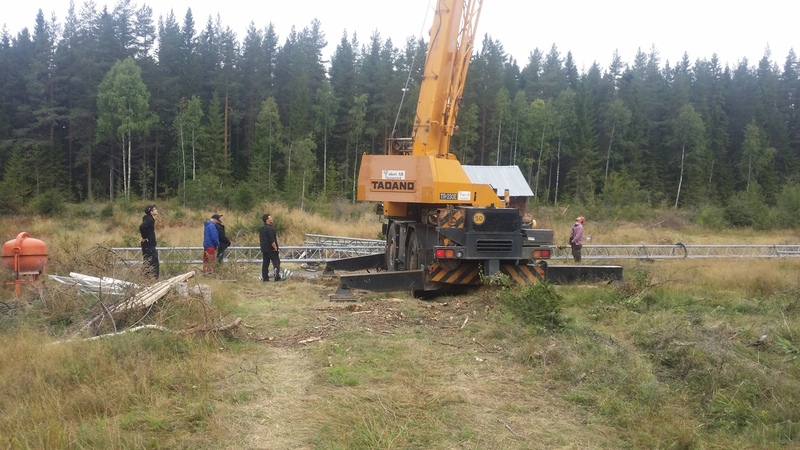 So we were a good bunch of people helping out and it just took one hour from when the crane came until we were done. 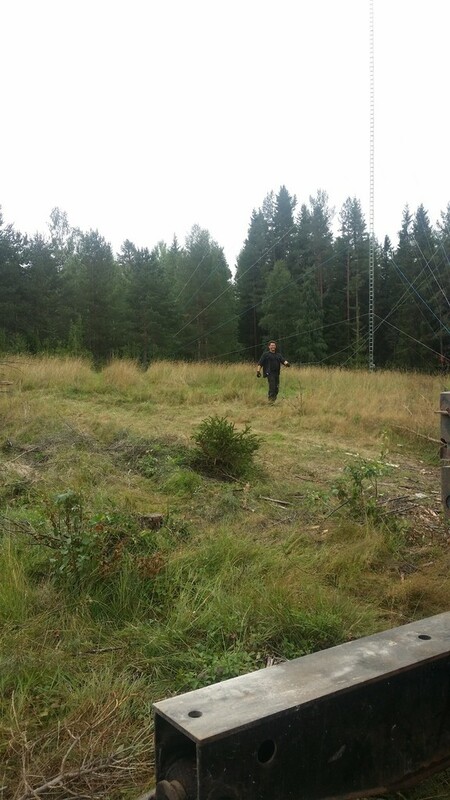 During coffee afterwards SM2NOG showed up since he had gotten the idea we were going to lift the tower at 11 and not 9 🙂 SM2XJP also came by but by then the coffee pot was empty, however he got some nice burgers instead from chef SM2UVU. 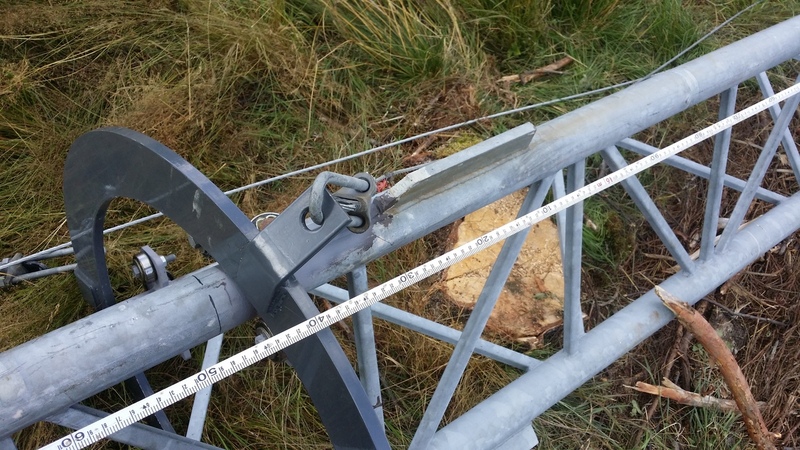 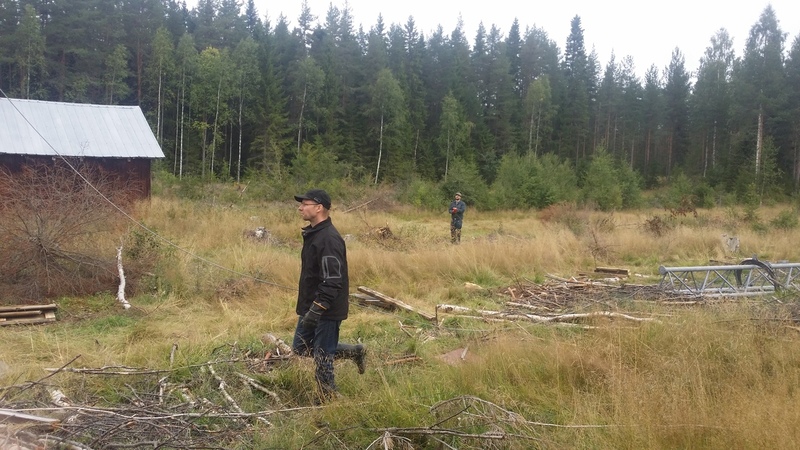 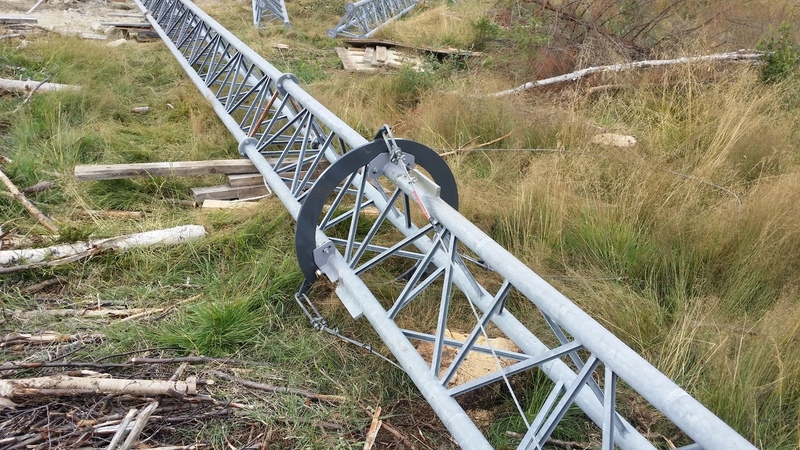 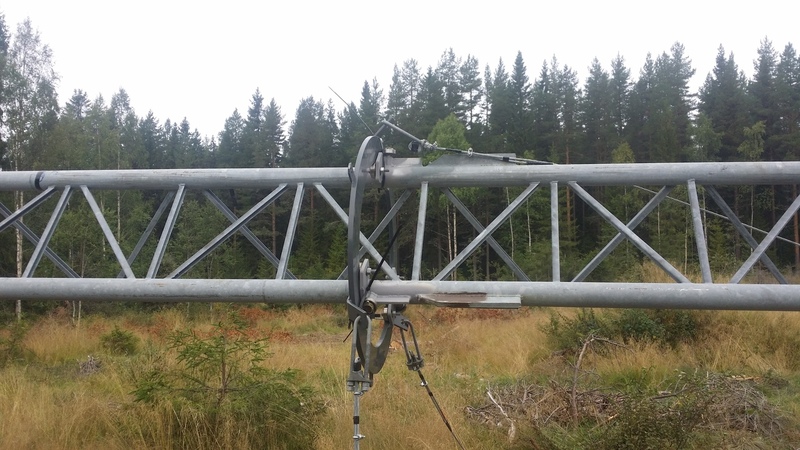 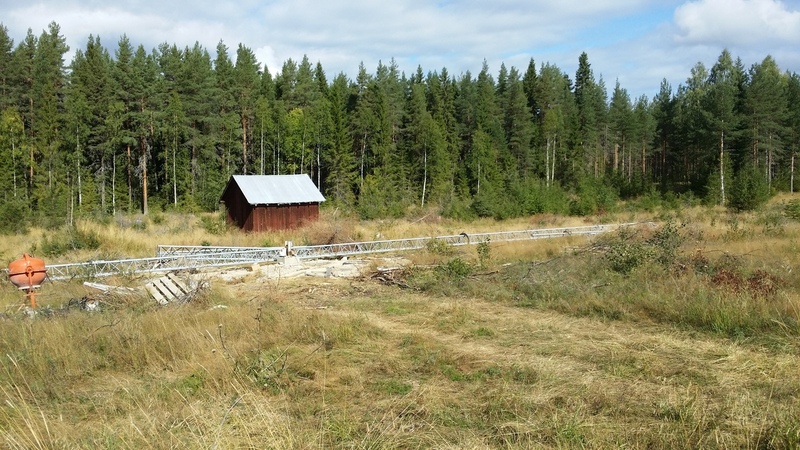 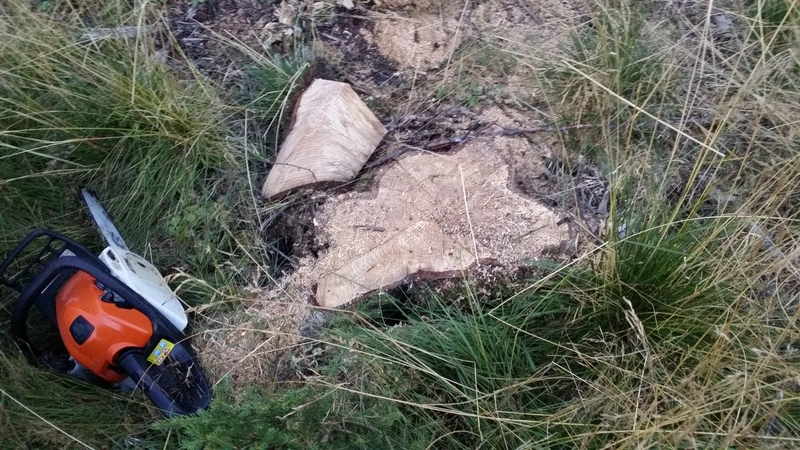 We also discovered some issues with the 40m 4-SQ where the cable had been severely messed up by the forest machines a couple of years ago but we didn’t see it until now. 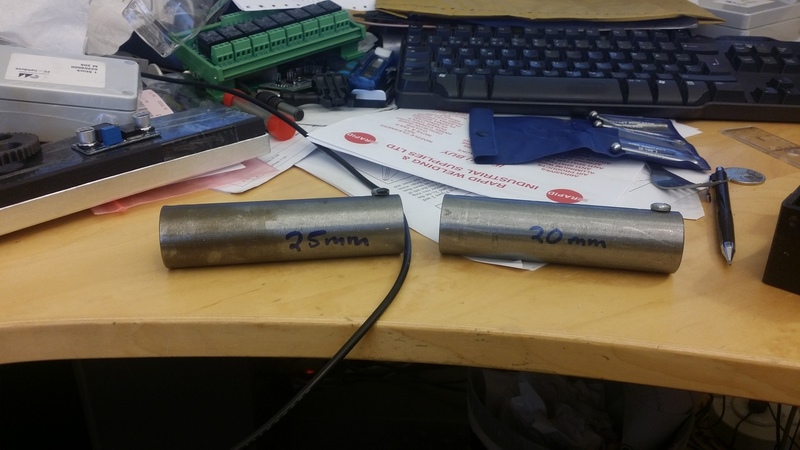 I will need to replace parts of the cable. 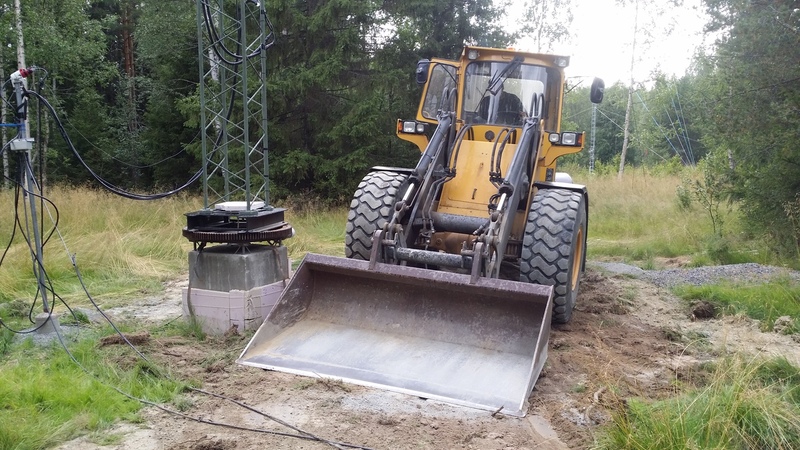 We also got problems again with the 7/8″ cable we had problems before last winter with ice in the connector and I guess there might still be water in the cable. 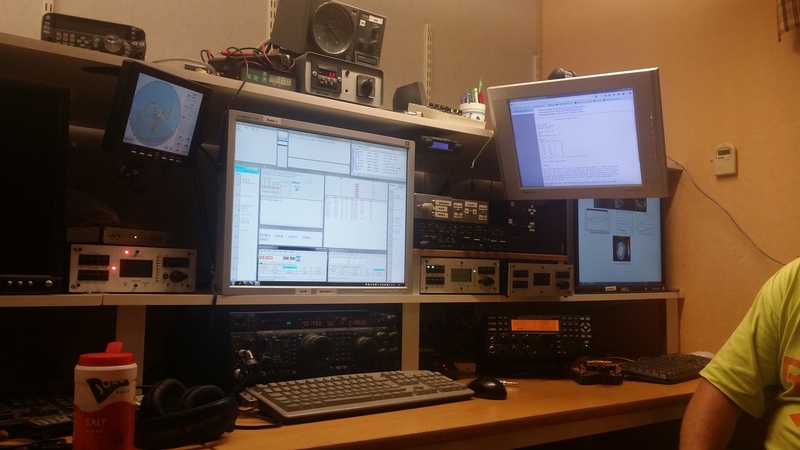 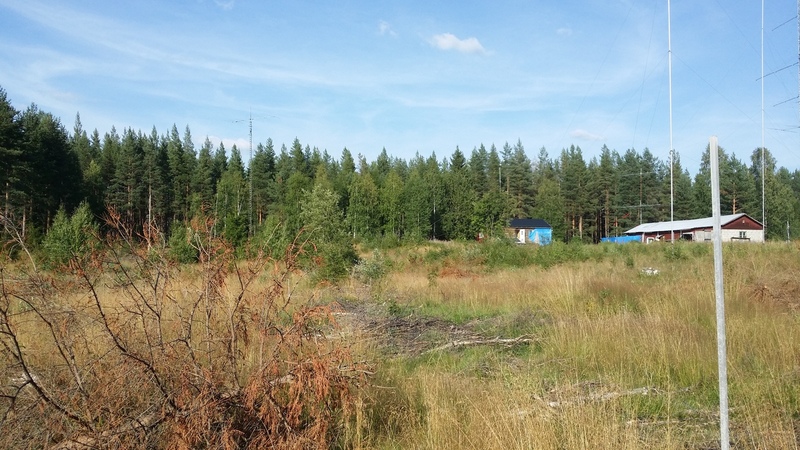 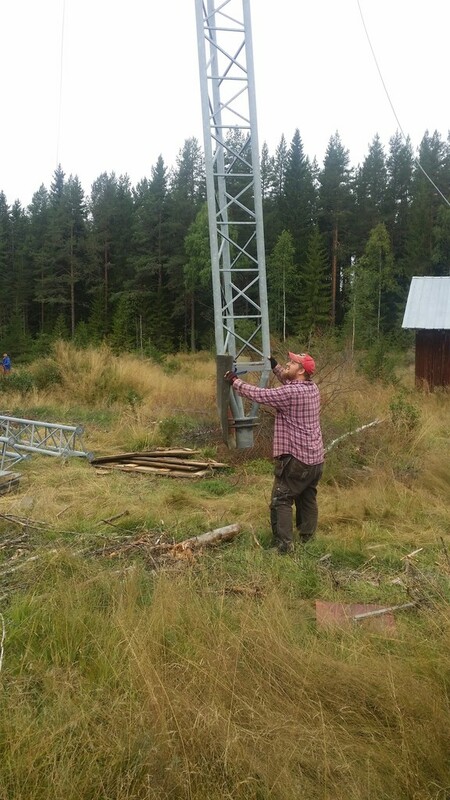 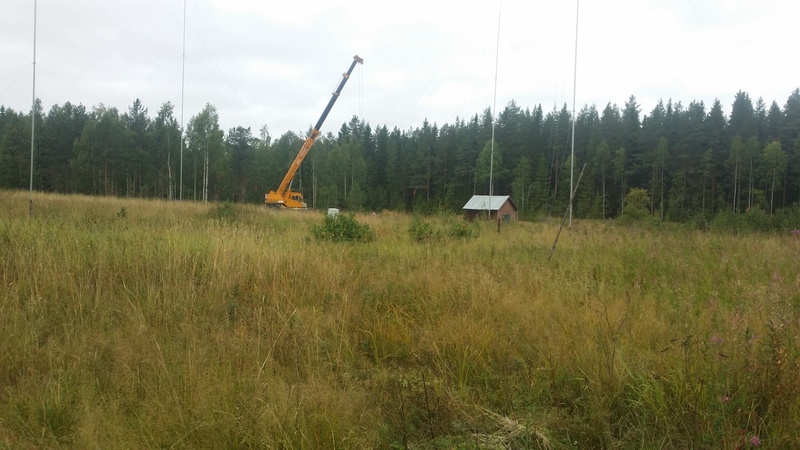 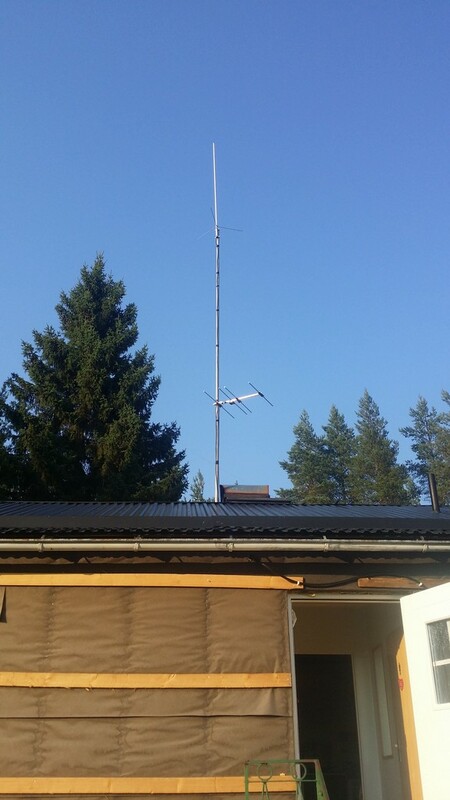 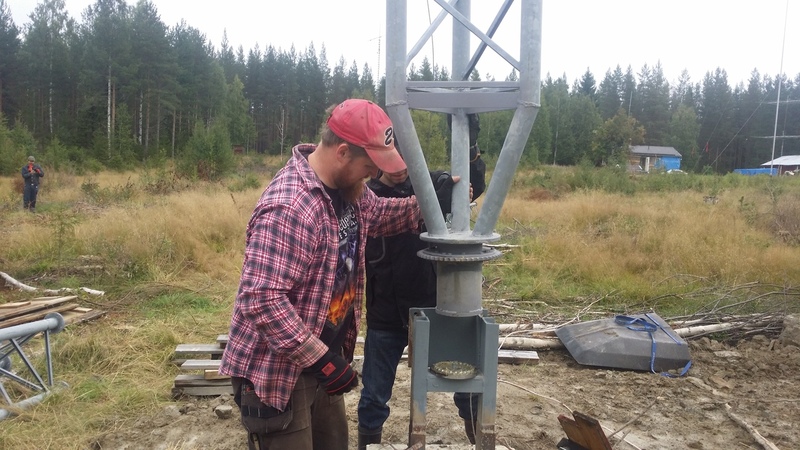 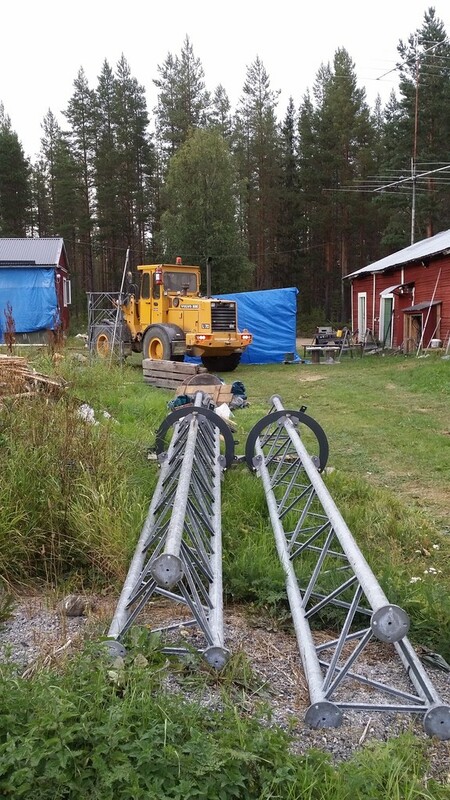 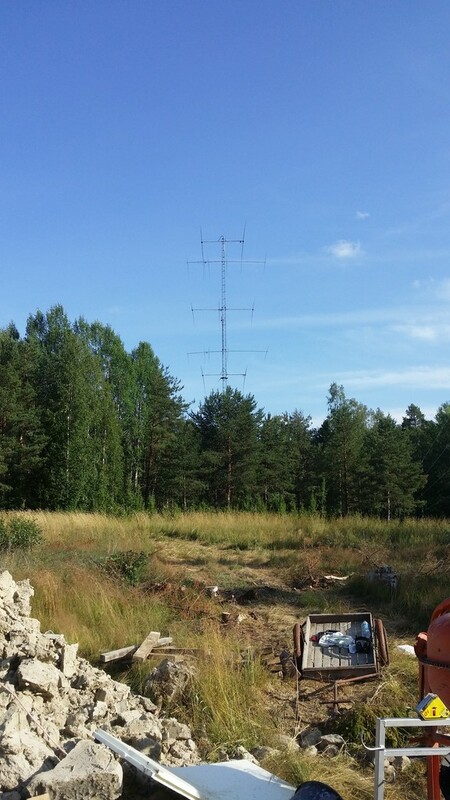 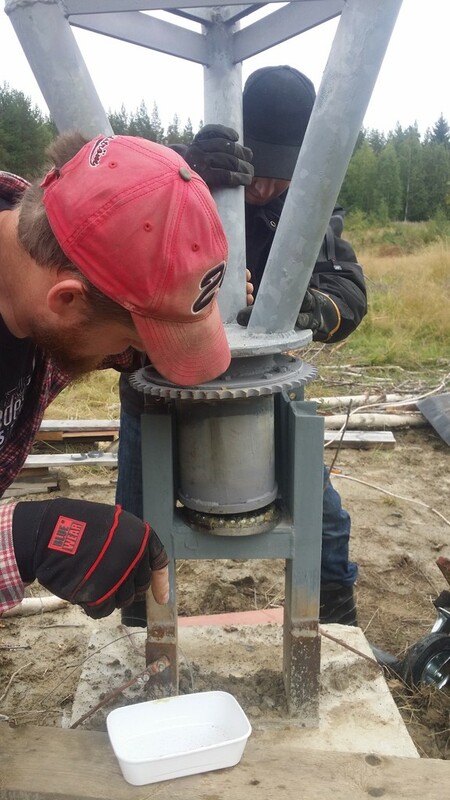 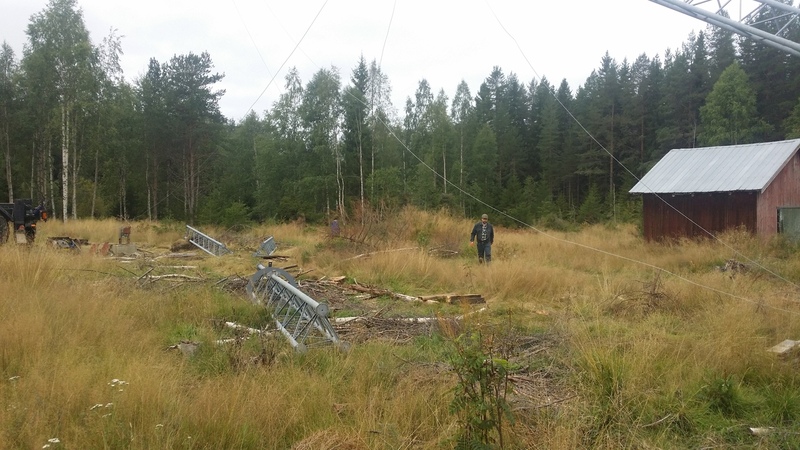 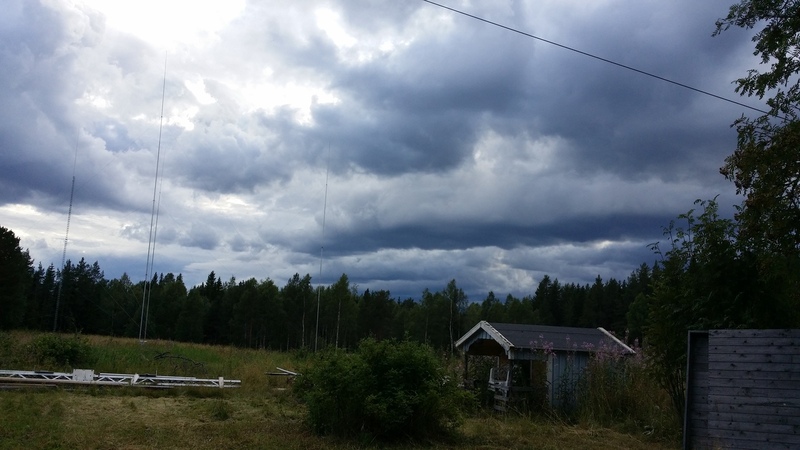 So me and SM2XJP pulled through two new 7/8″ cables, one for the 5/5el 20m stack and the other for the soon to be 15m stack in the Moskojärvi tower. 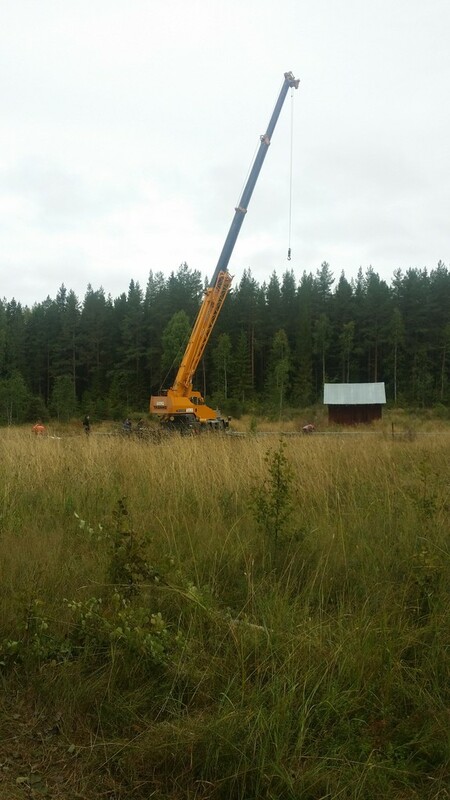 I will try to book a bigger crane for next weekend so we can get the last of the tower up so it will reach its full height of 60m. 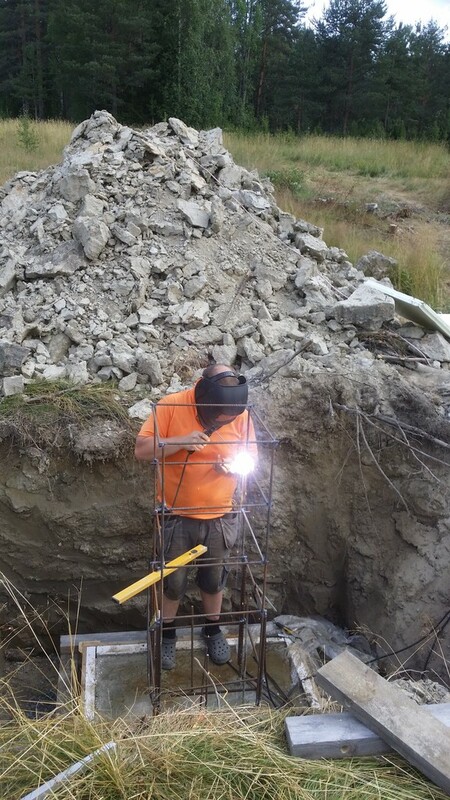 SM2LIY took all the pictures and I also had a GoPro camera that did a time lapse of the work which can be seen below. 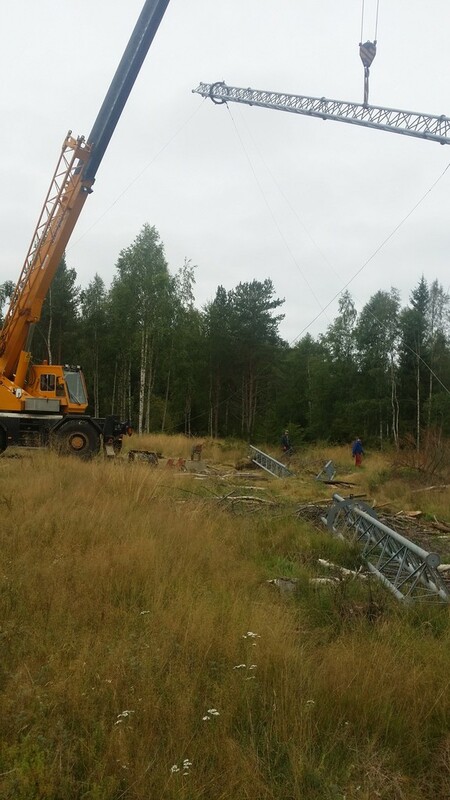 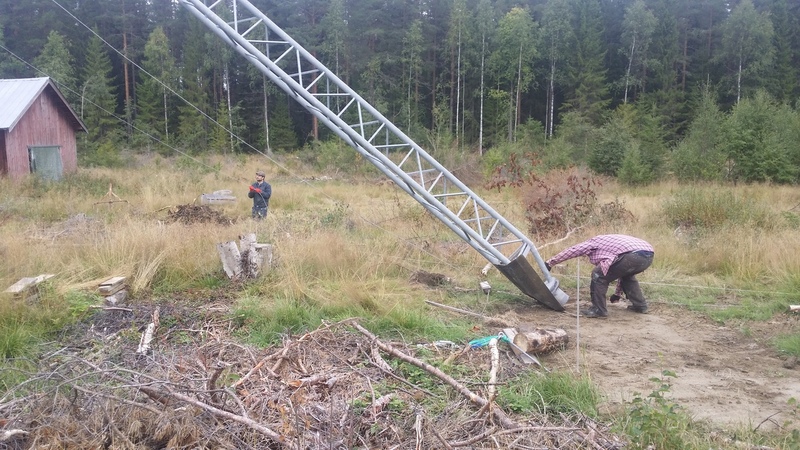 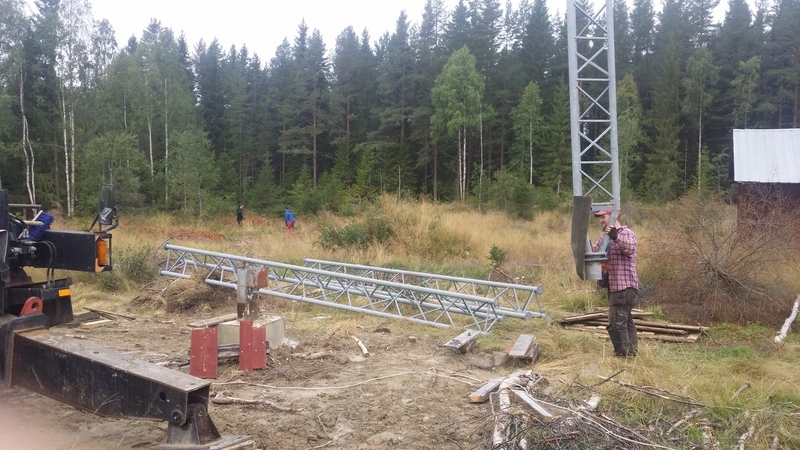 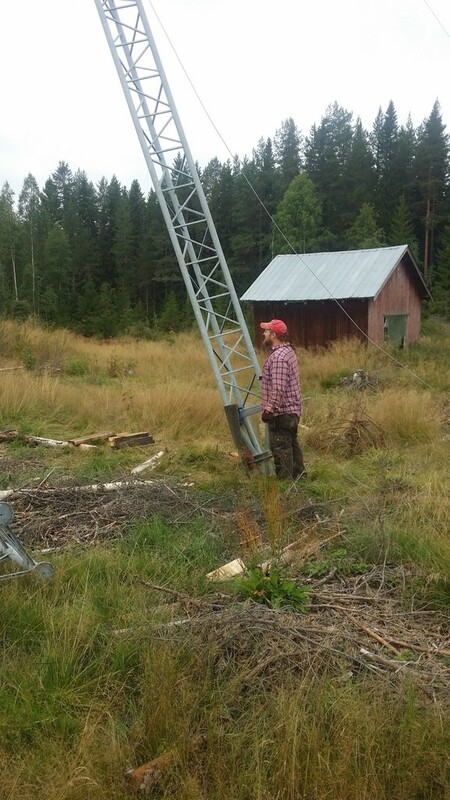 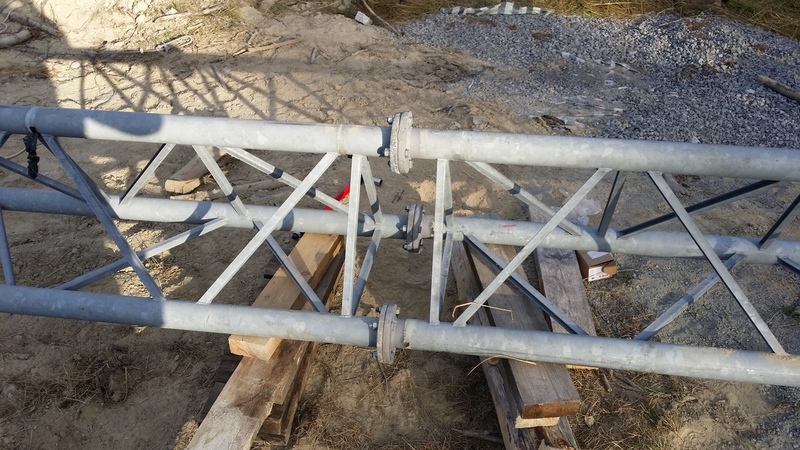 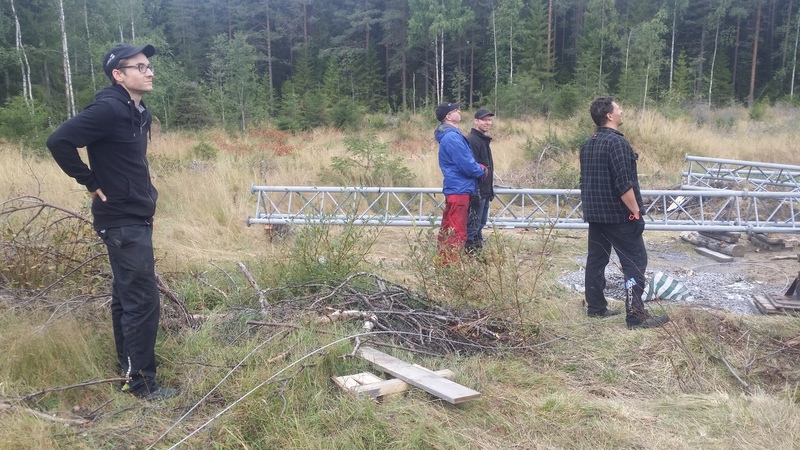 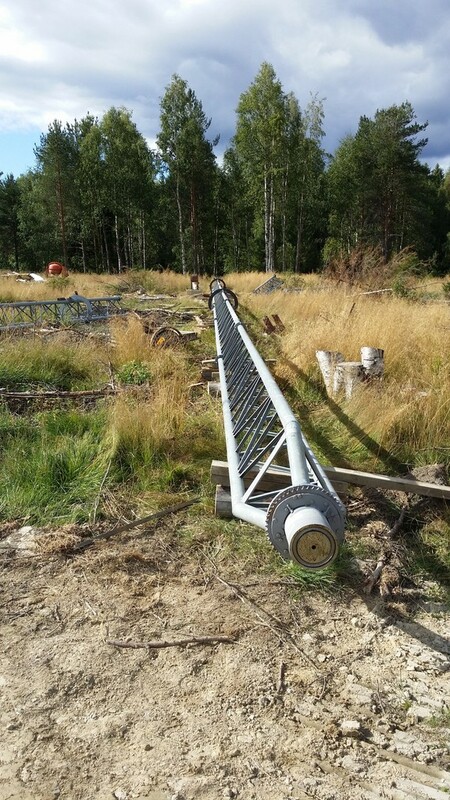 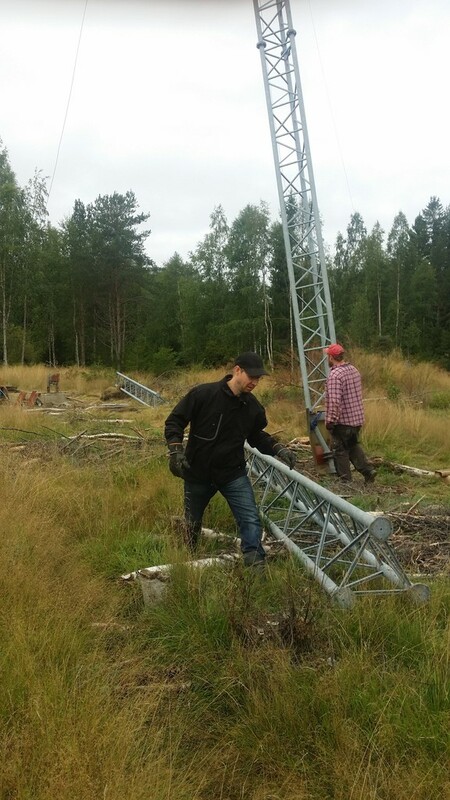 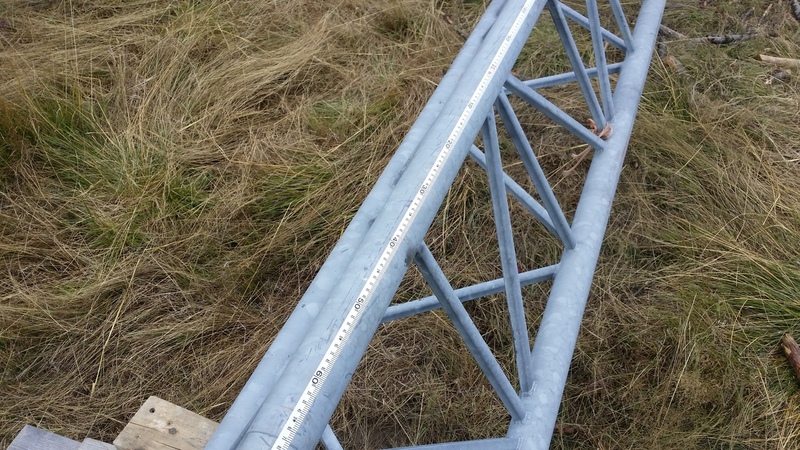 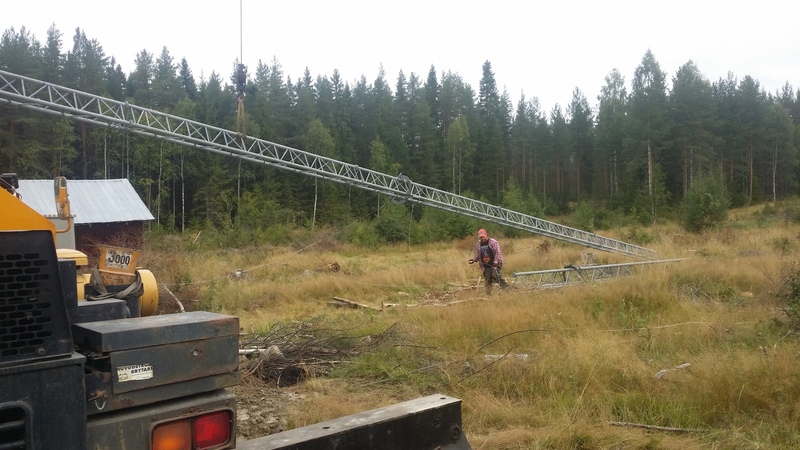 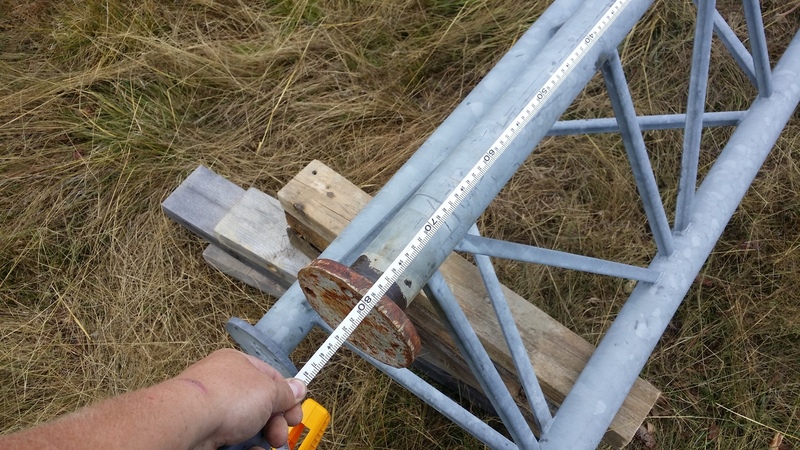 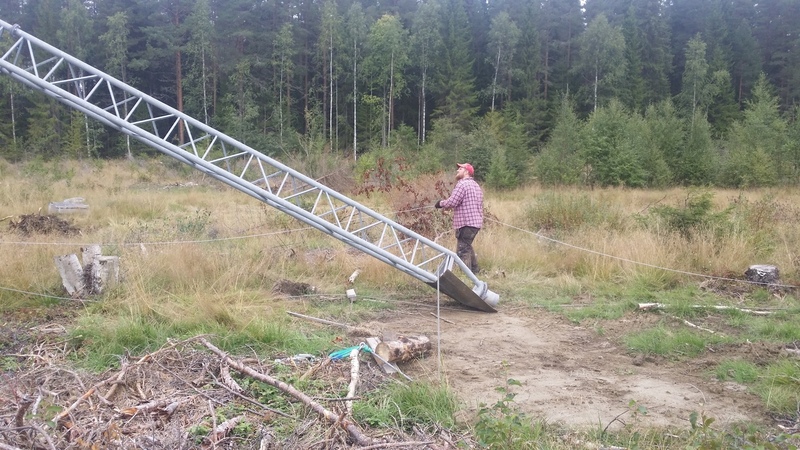 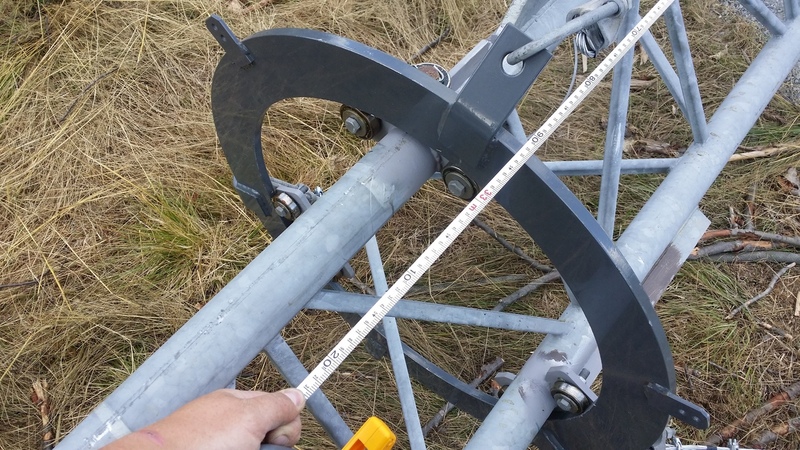 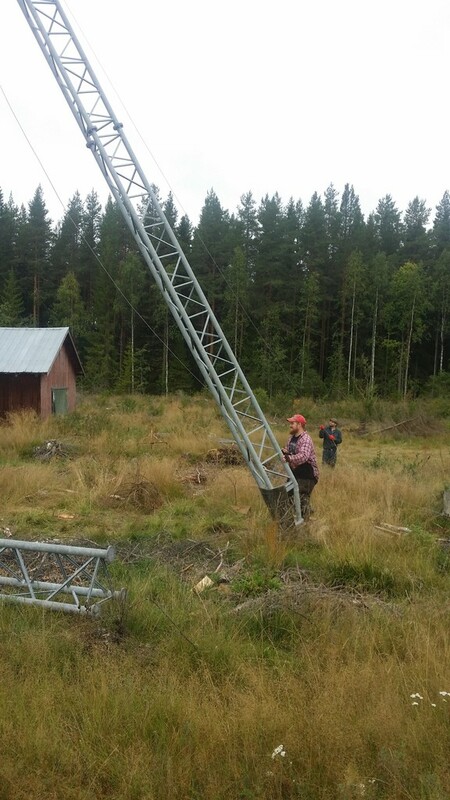 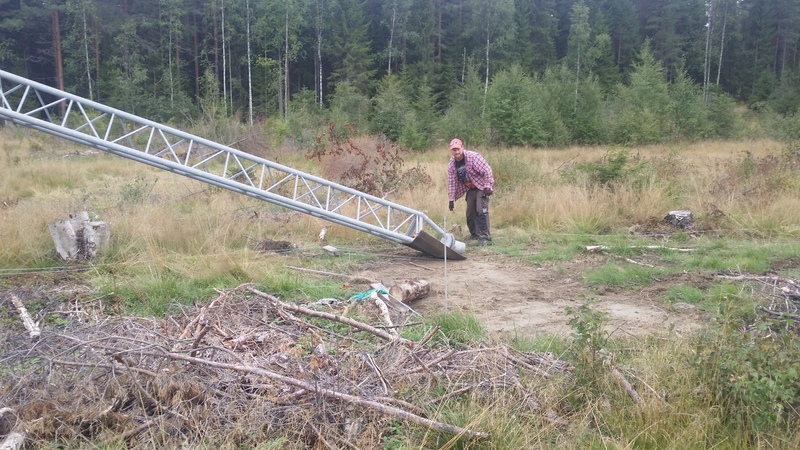 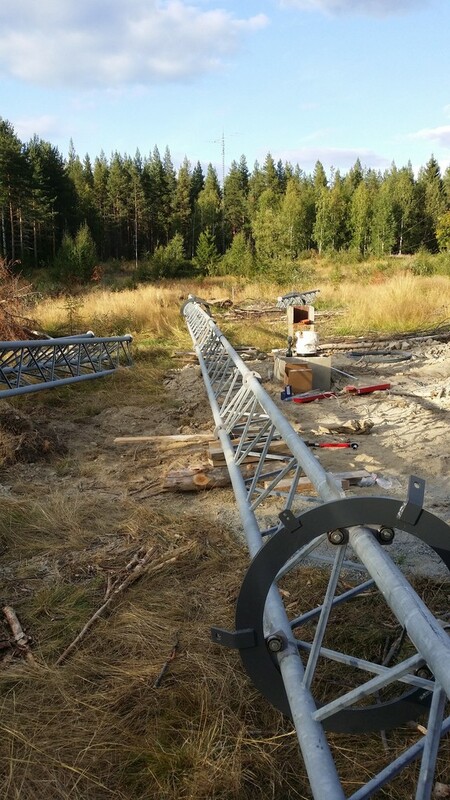 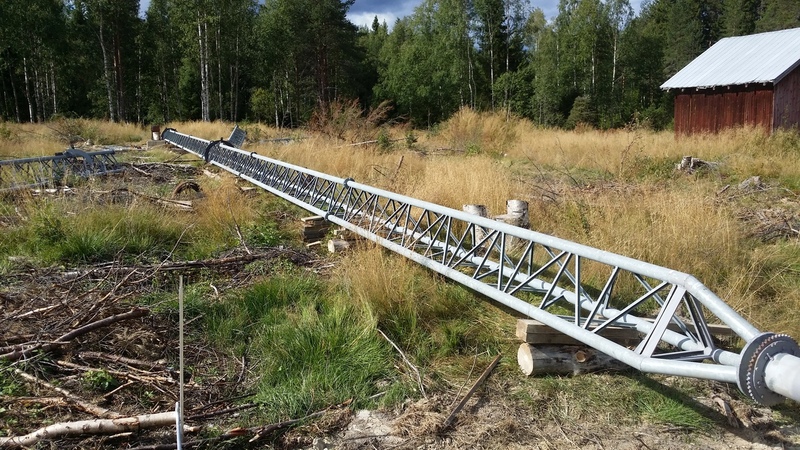 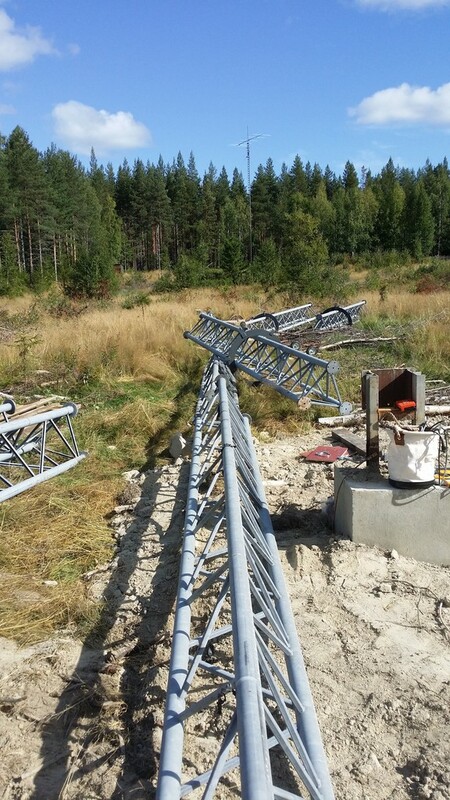 Last week I did some preparations so we could hopefully lift the first 36m of the 60m tower the weekend after. 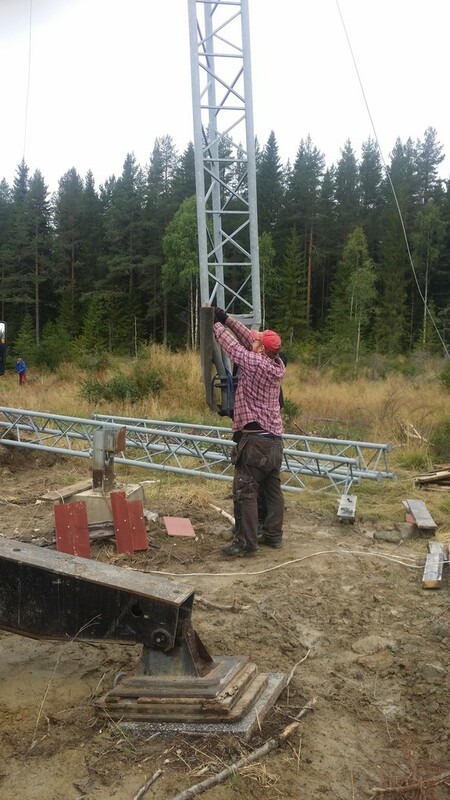 Everything went great but it was a bit hard to lay out the tower sections by myself but I managed. 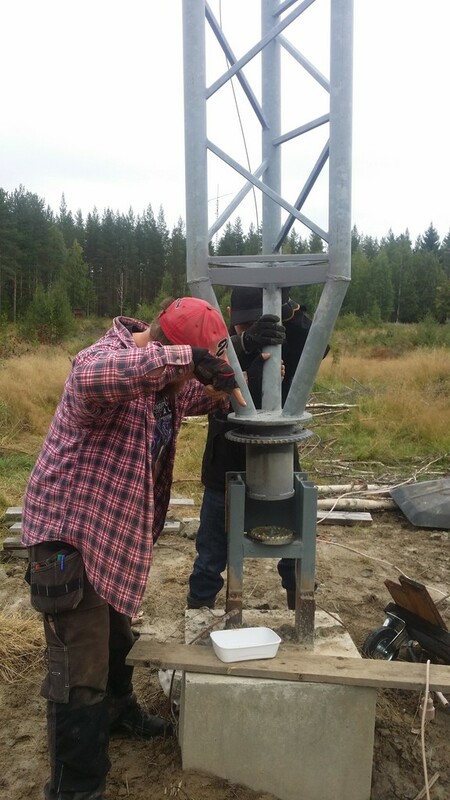 On Sunday all the sections were bolted together and the guy wire lines were in place and we could head north again to do another week of work. 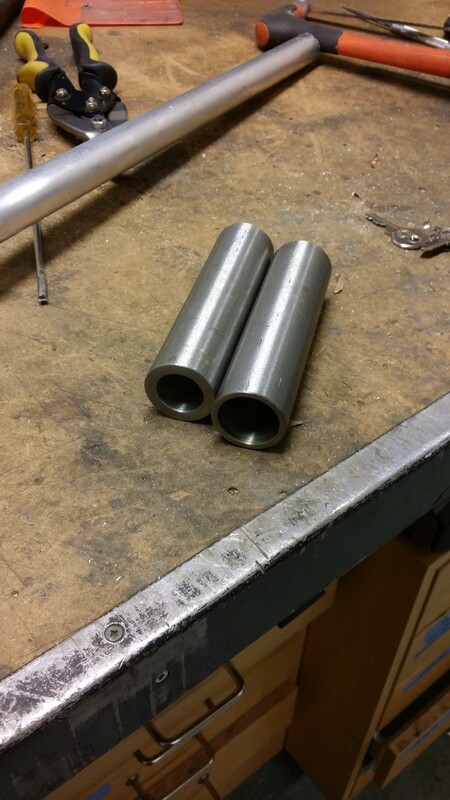 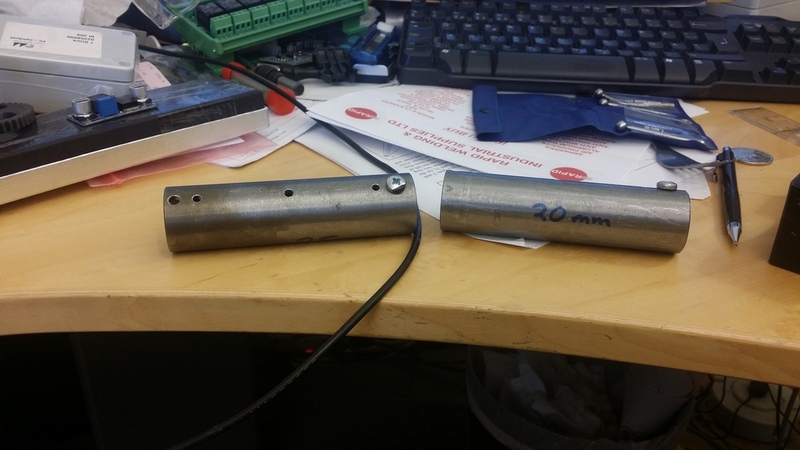 I also made some drilling templates for 25 and 20mm tubing. 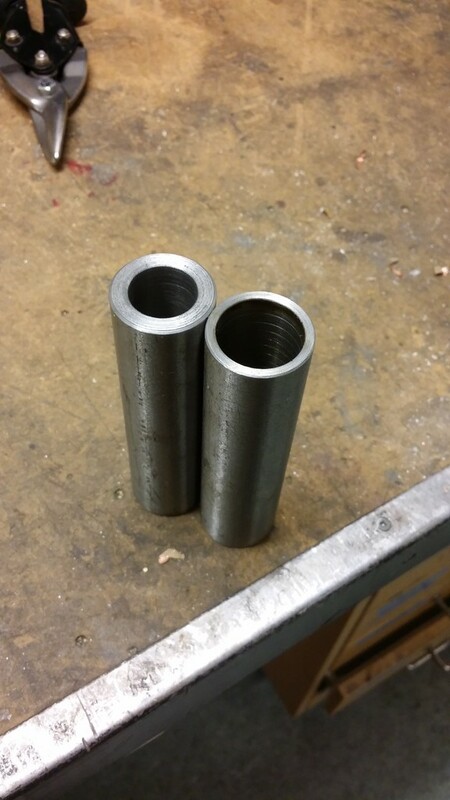 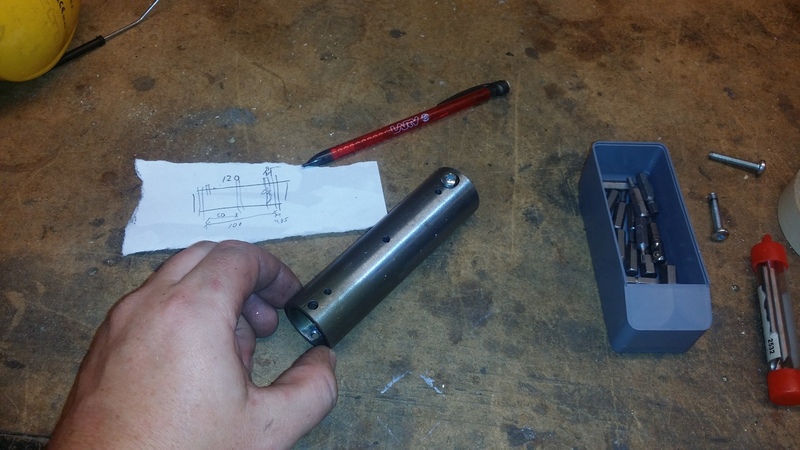 I will use these to drill the holes in all aluminum tubes so that they fit together properly and is quick to build. 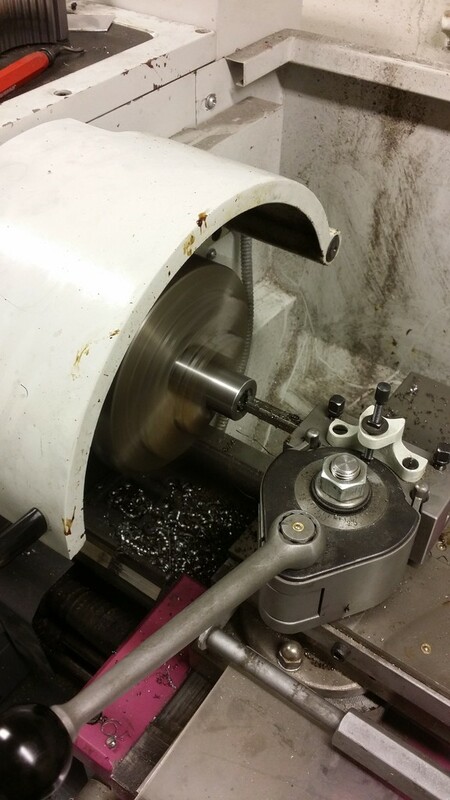 I will try to get them heat treated so they don’t get “eaten” up by the drill too fast. 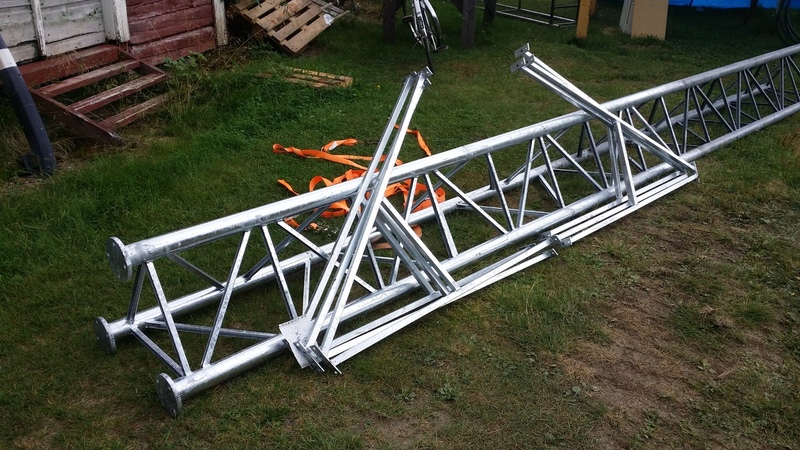 SM2XJP went down with the tower section me and SM2UVU fixed to get it galvanized. 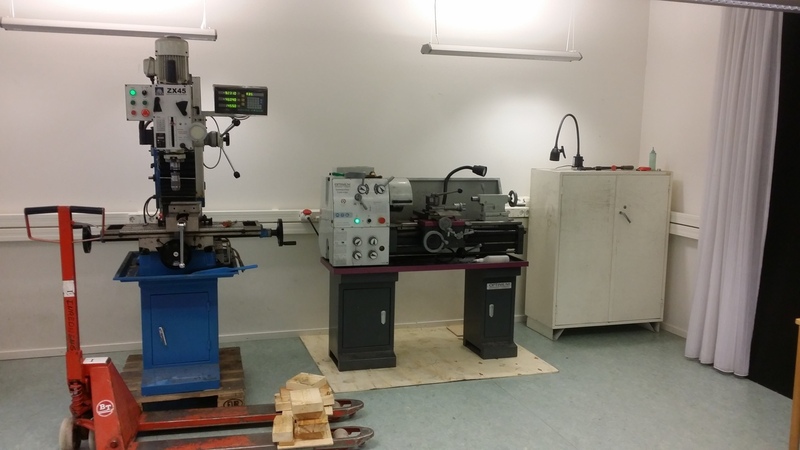 A company Gallac in Skellefteå who has got a big factory said no to the job. 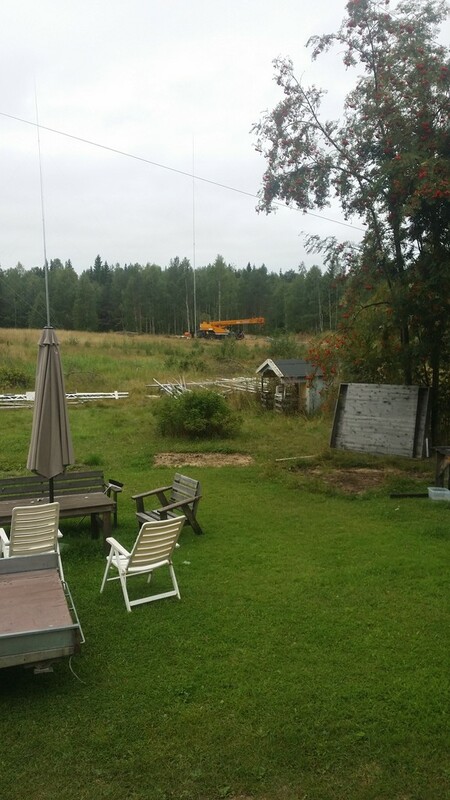 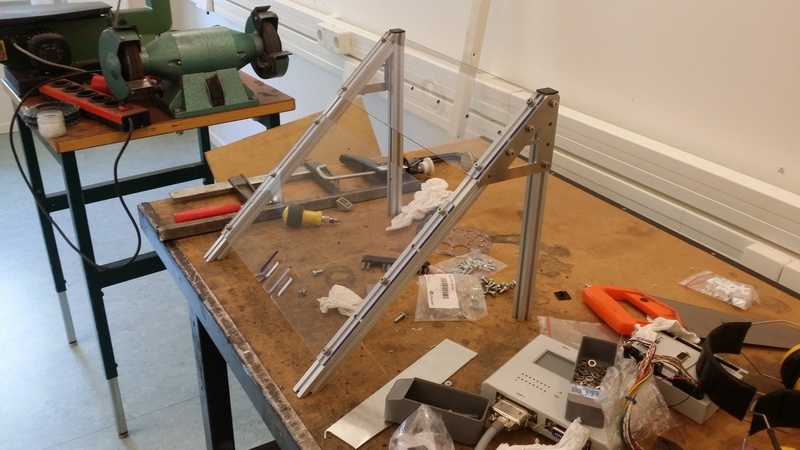 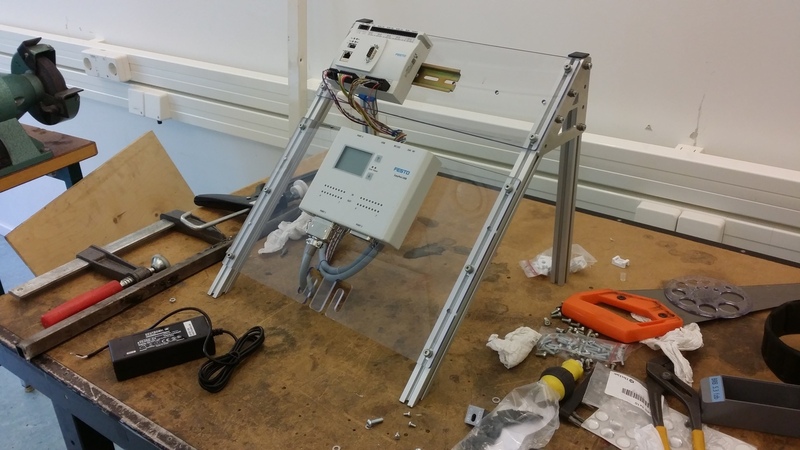 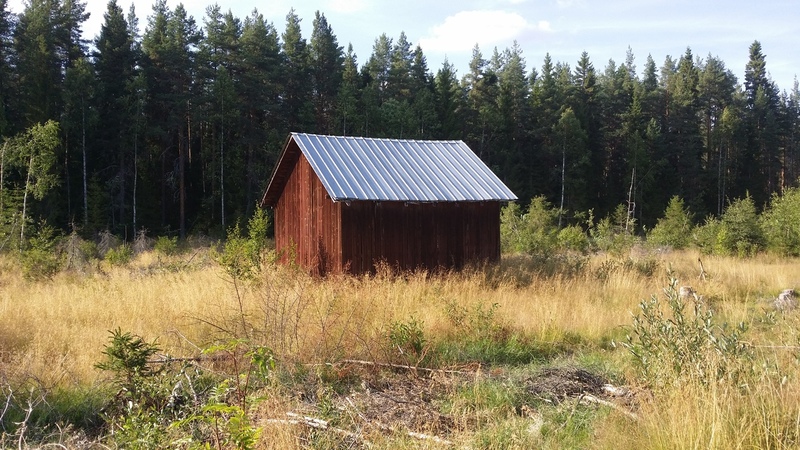 So I called a company called Galvpart in Vännäs who are a lot smaller but they accepted the job for a very fair price. 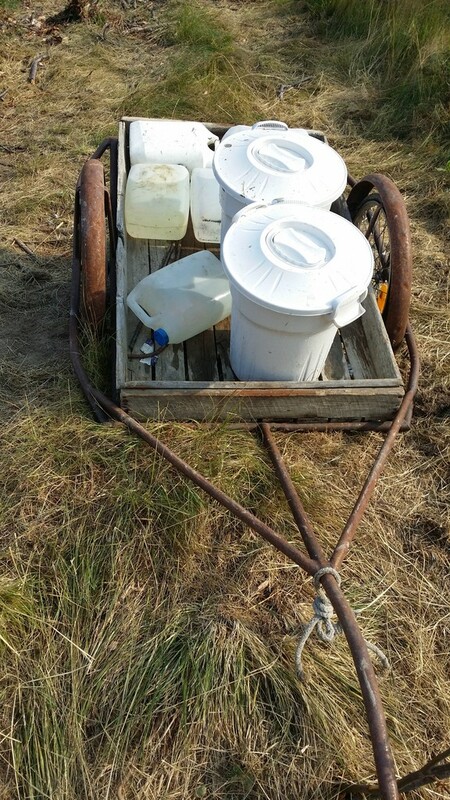 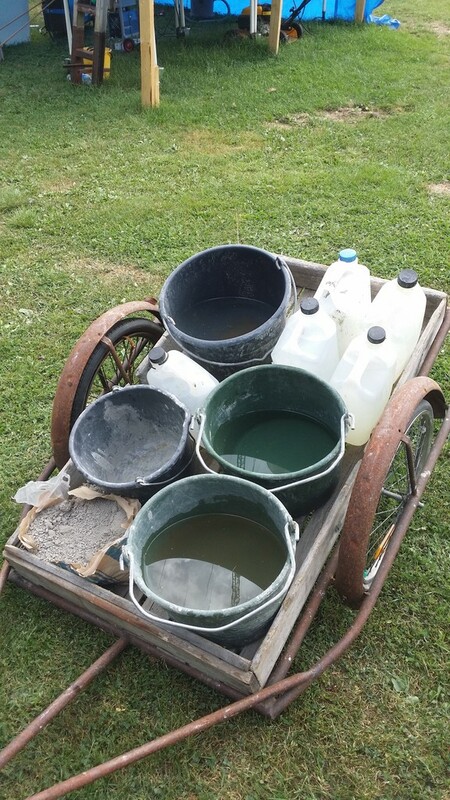 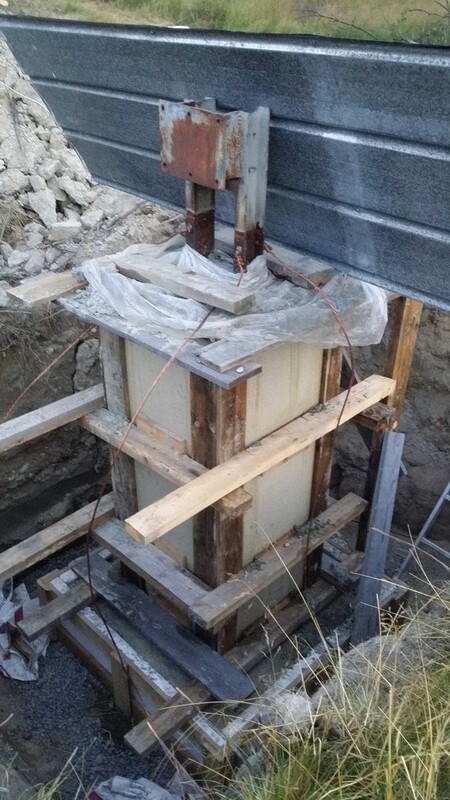 The problem is that they need to remove all zink from the old section before they can put it into one of the bath needed before the actual galvanization. 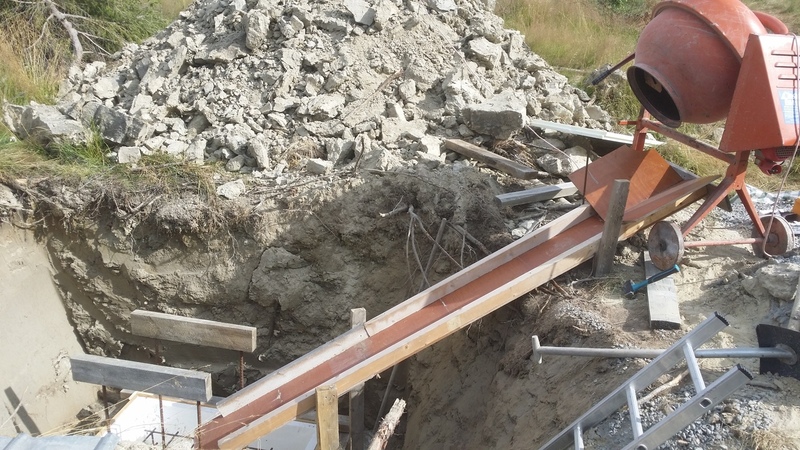 However Gallac said they did not have a big enough room for the 6m section since their bath is only 5m long. 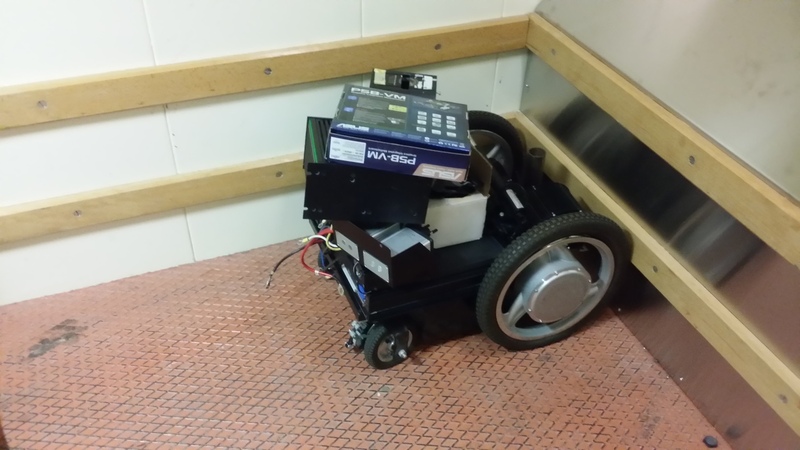 However Galvpart have an even smaller bath which is 2m long but they managed to fix it anyway 🙂 By Thursday they had it done so SM2XJP went the 250km roundtrip today and picked up the parts. 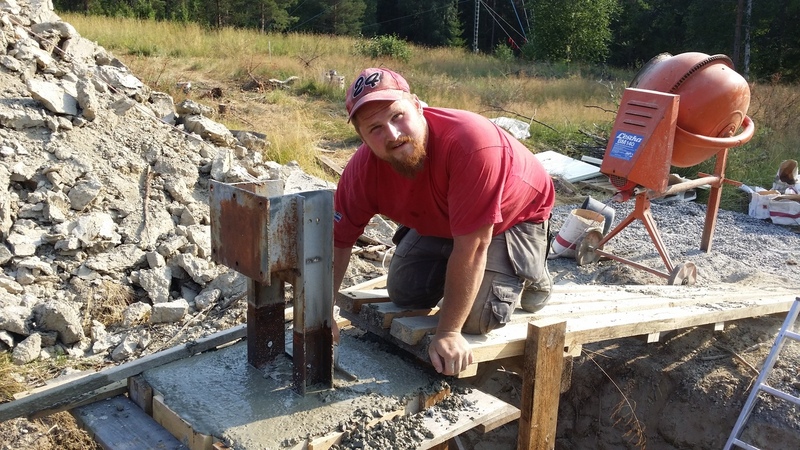 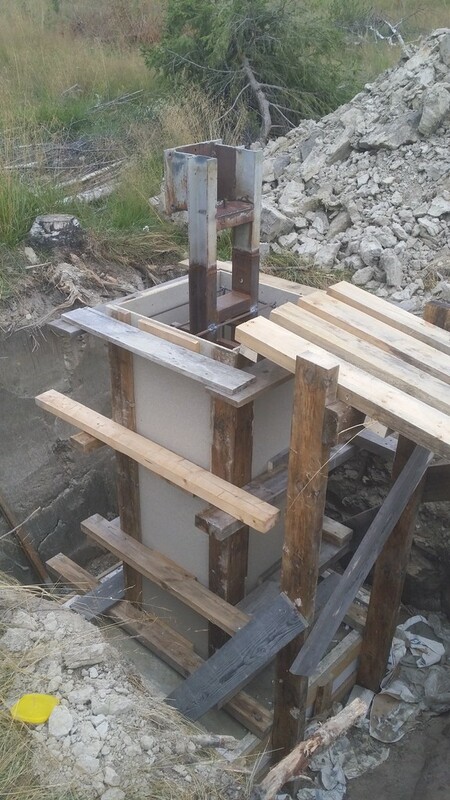 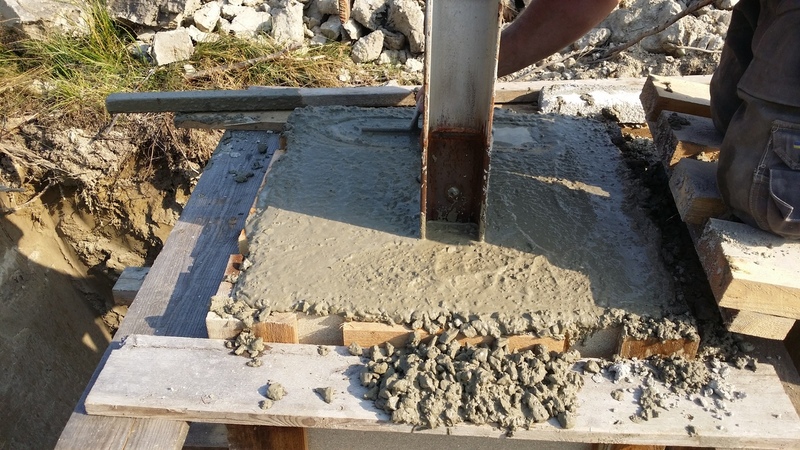 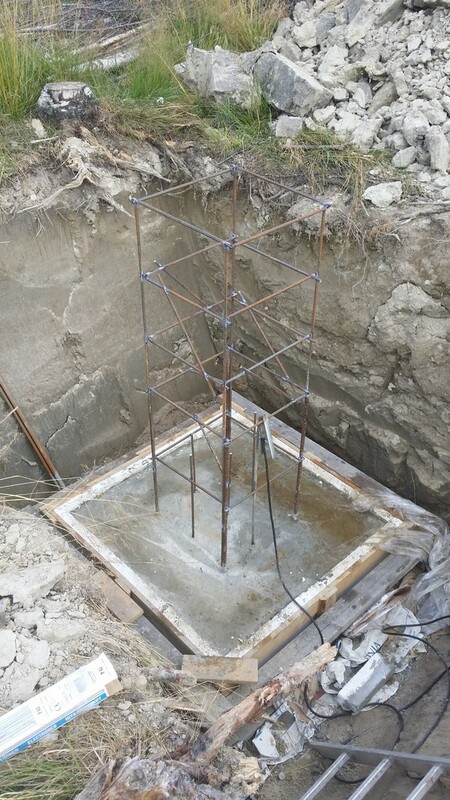 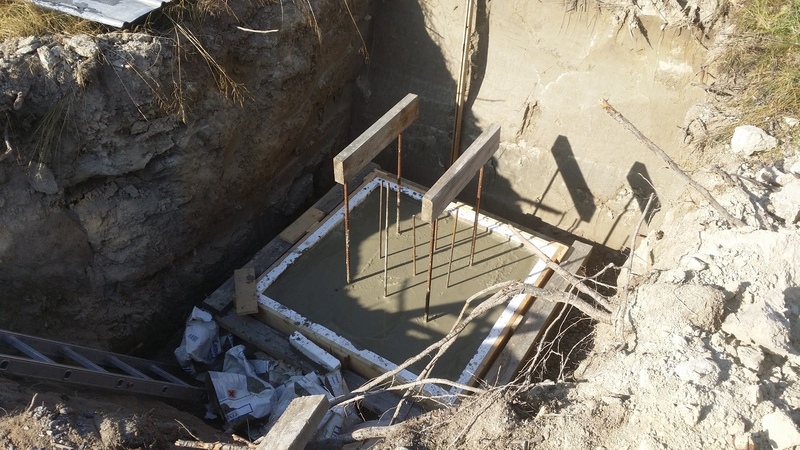 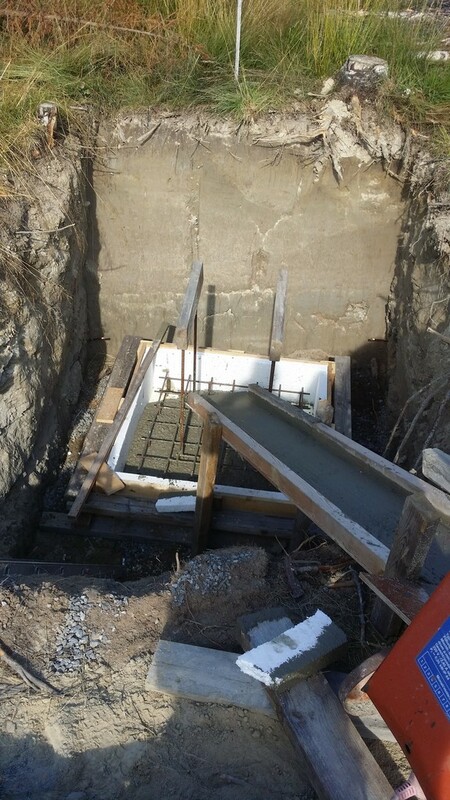 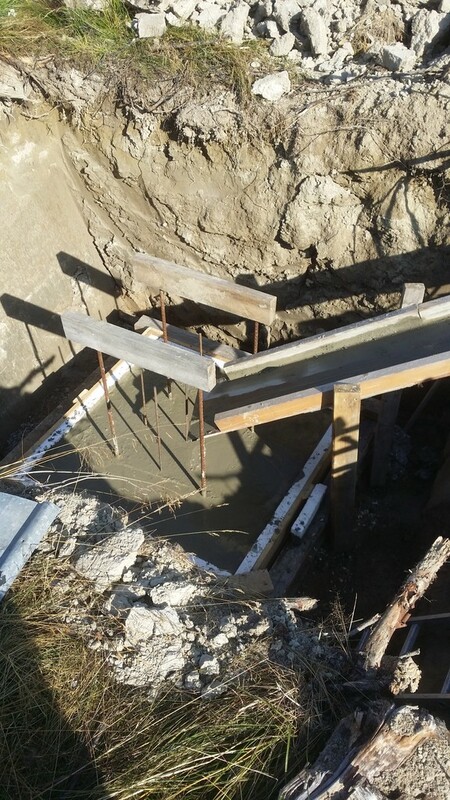 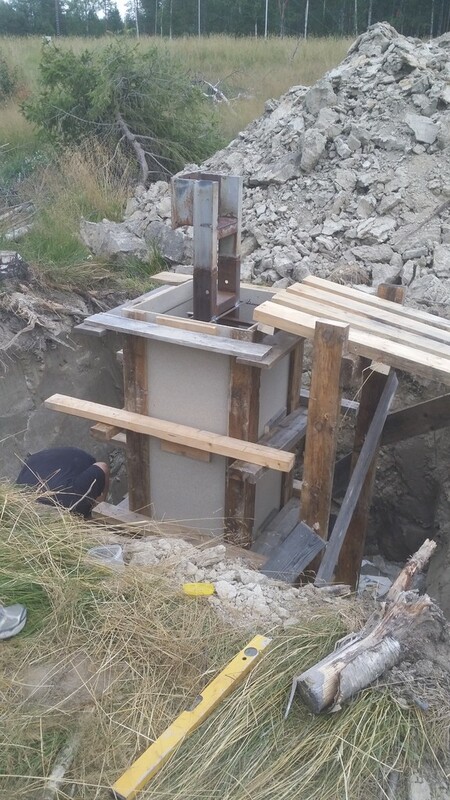 SM2LIY helped me previously this week to pour the concrete for the pillar. 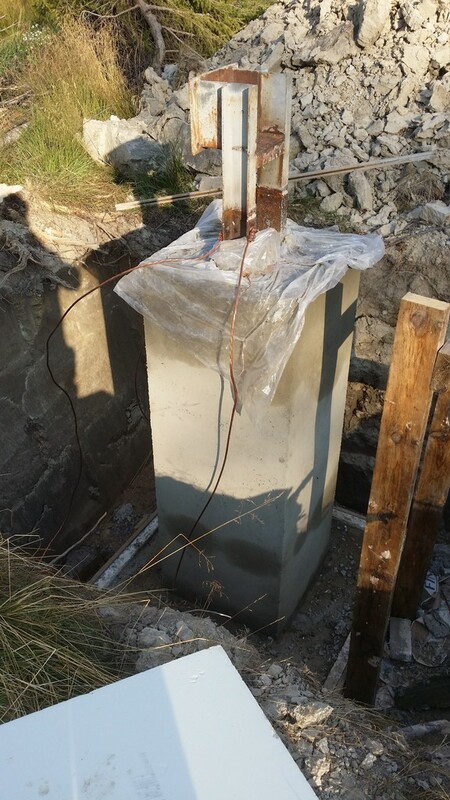 It contains about 600l of concrete so it was very nice having Per getting water when we ran out of it and also “stomping” the concrete to get rid of air. 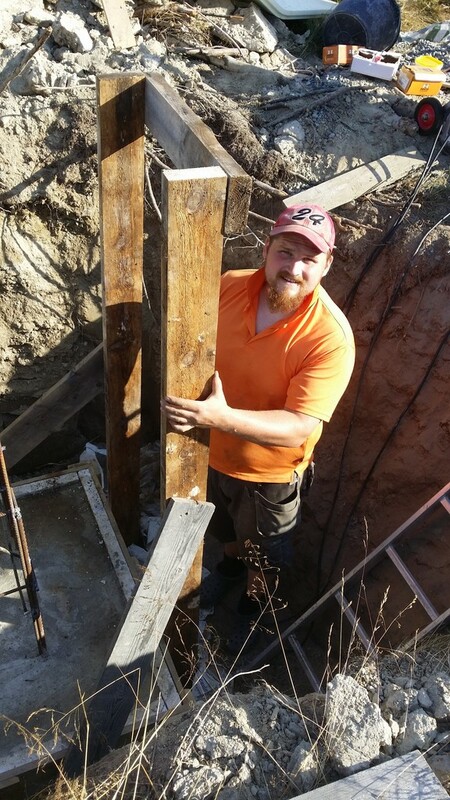 He did an excellent job so the foundation turned out great. 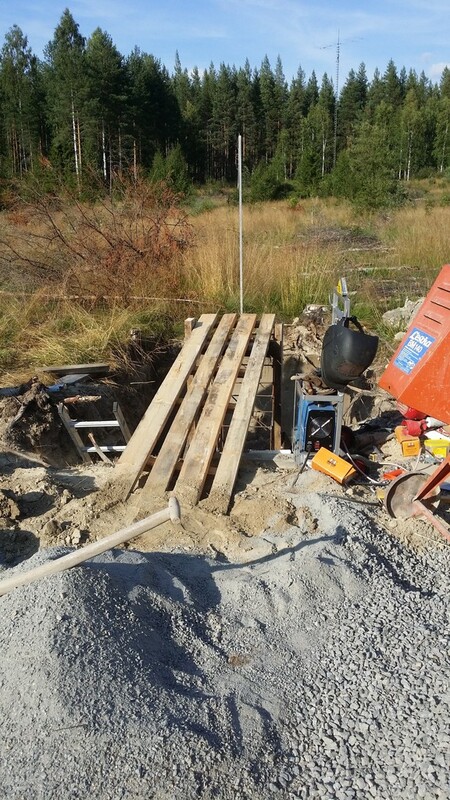 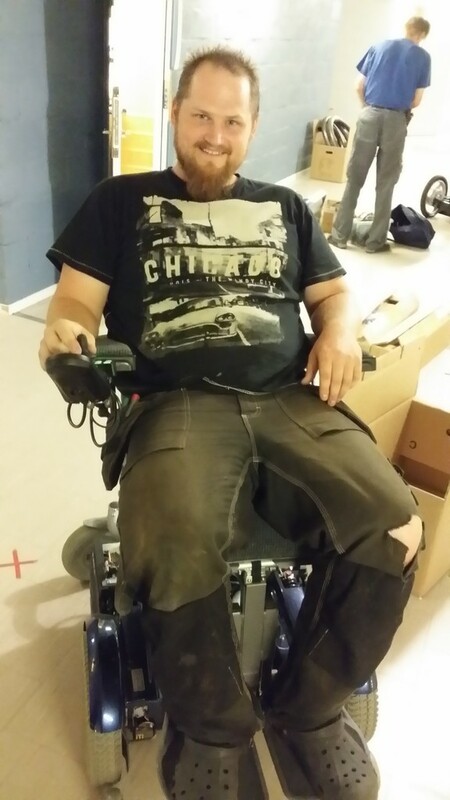 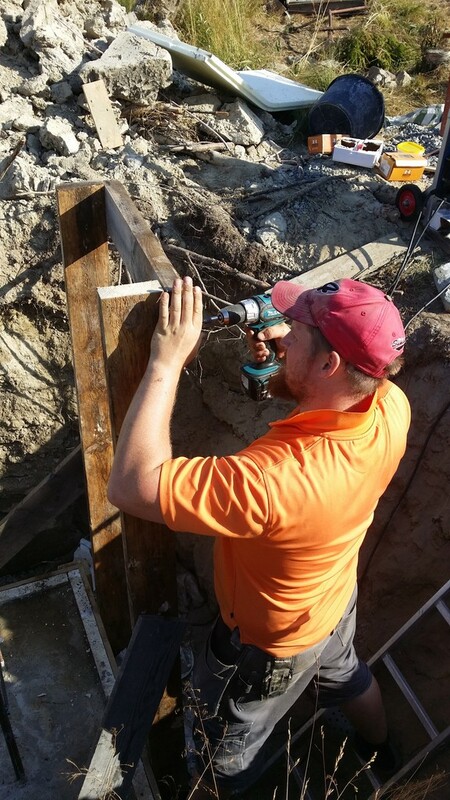 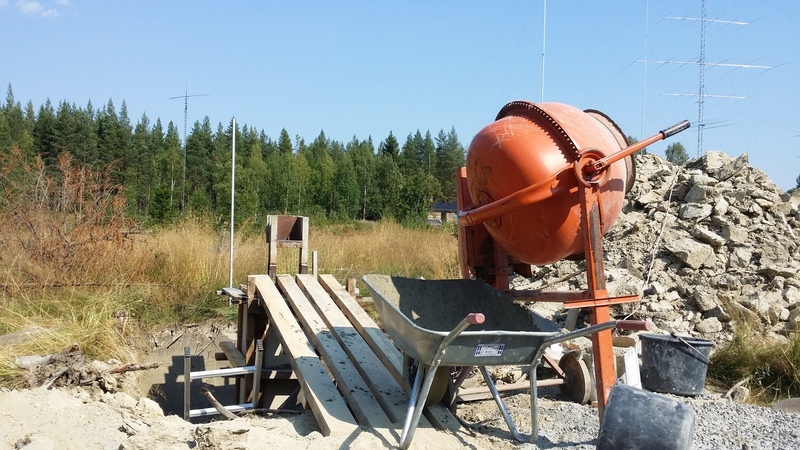 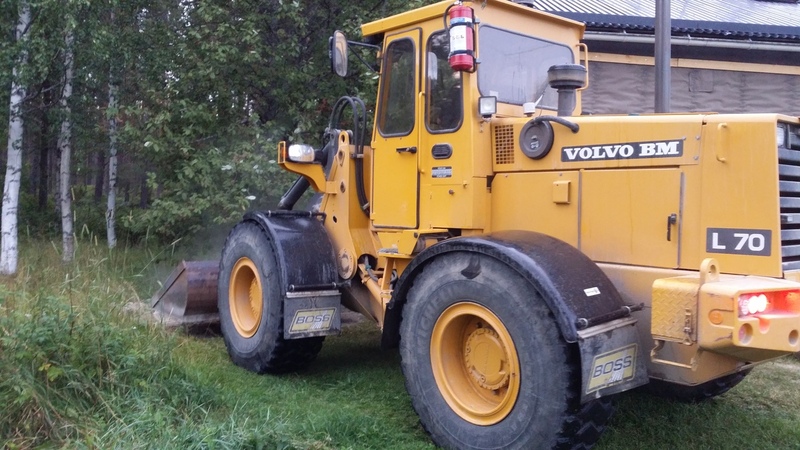 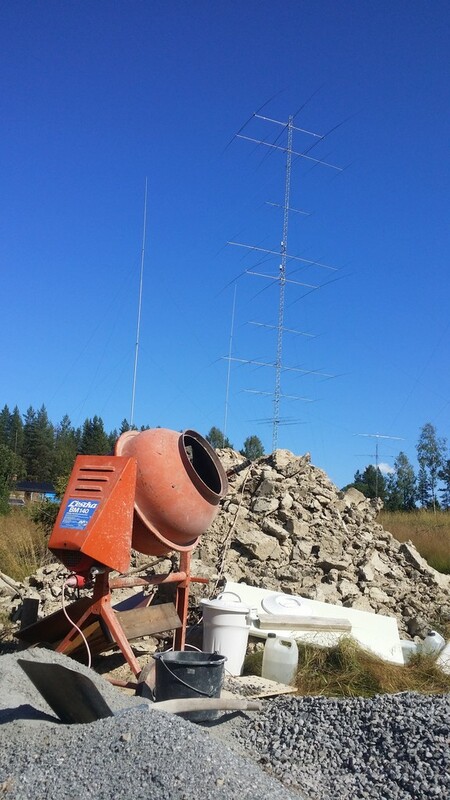 We got to borrow the L70 from GTL (local company) which SM2XJP drove and fixed the ground around the foundation. 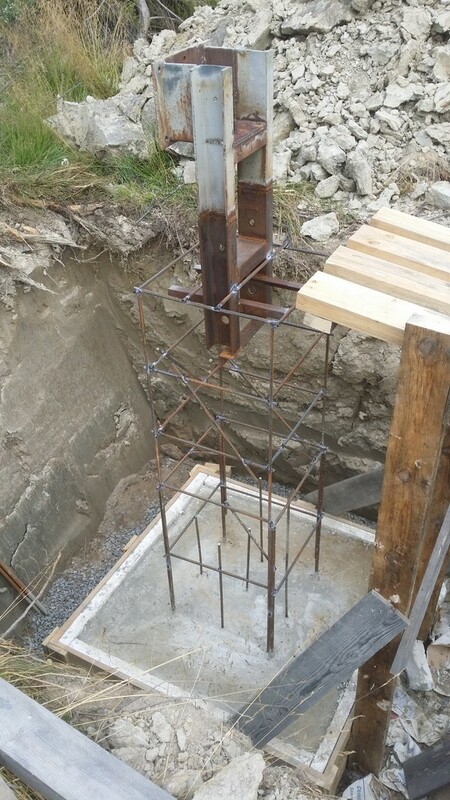 He also did change the angles a bit around the military towers foundation since water was gathering around the foundation instead of pouring away. 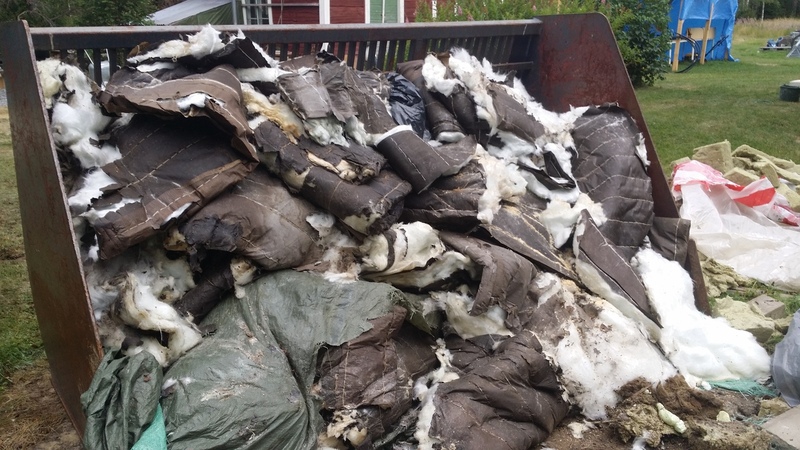 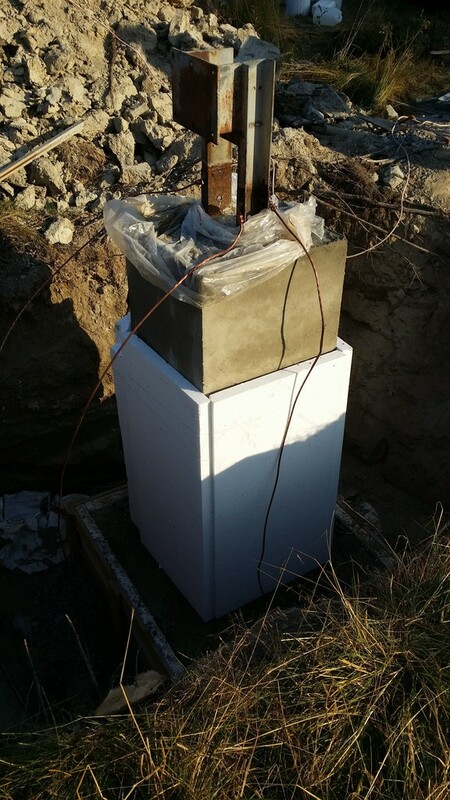 We also got rid of all old insulation material from the house which was great and the tower sections were moved into place so we don’t need to carry them so far. 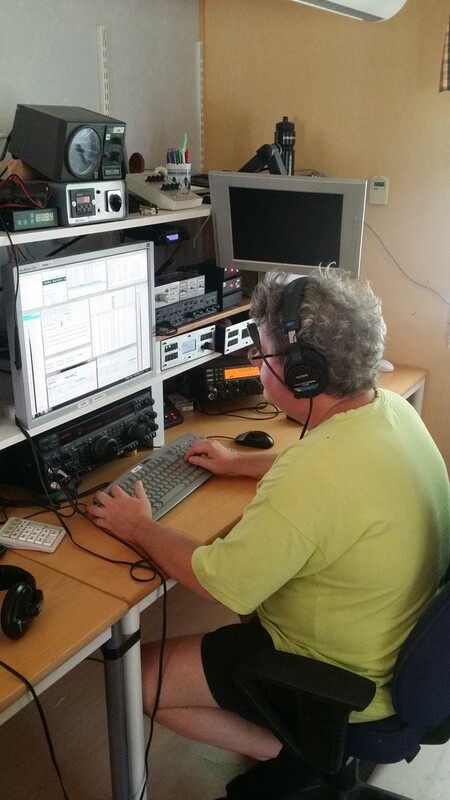 SM2LIY joined me at the station and helped out with some work. 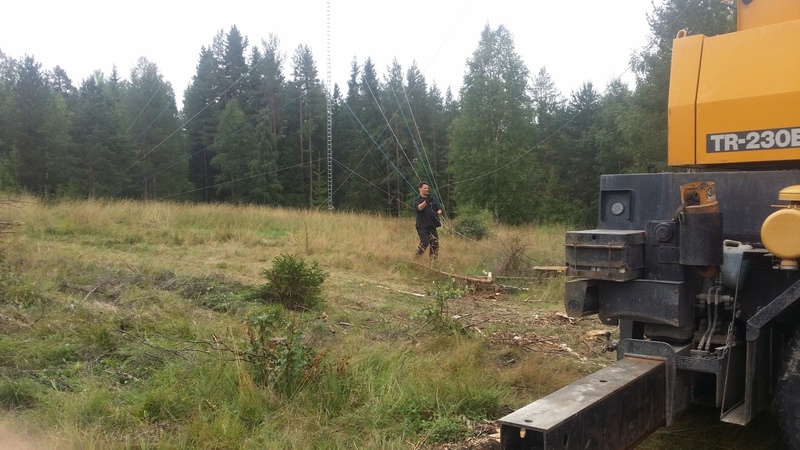 He also ran the EU HFC but unfortunately 10 and 15m was very poor up here so he had no chance against the rest of Europe. 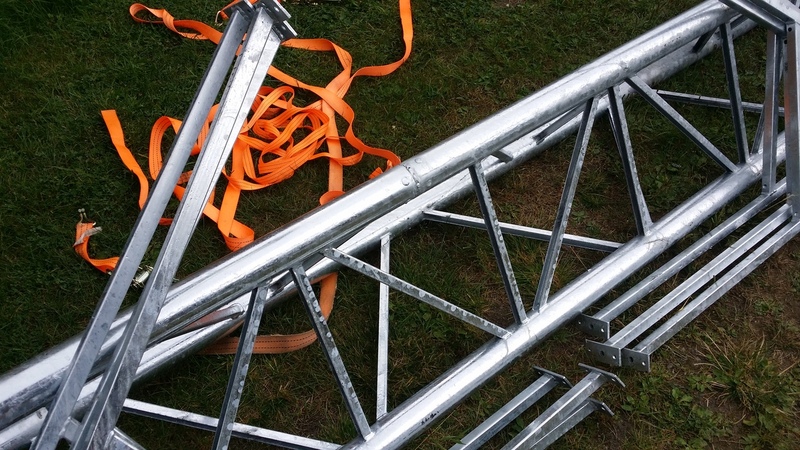 Better luck next year hopefully. 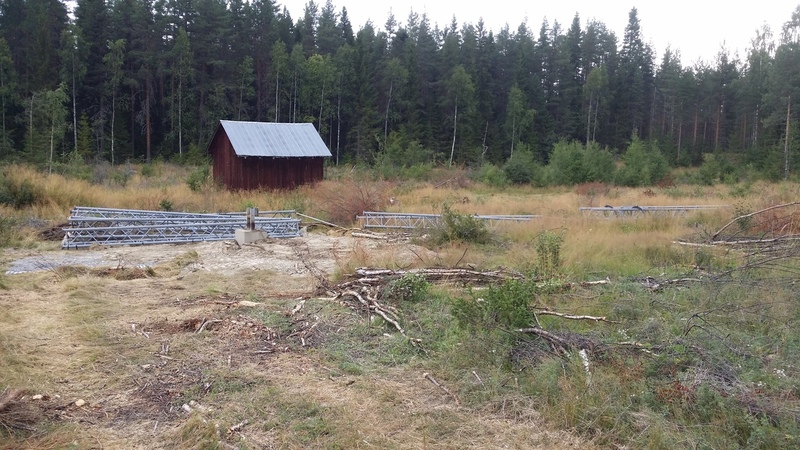 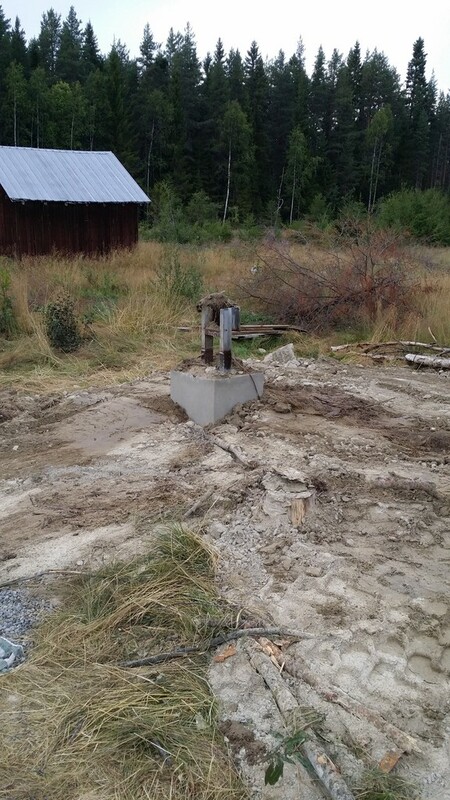 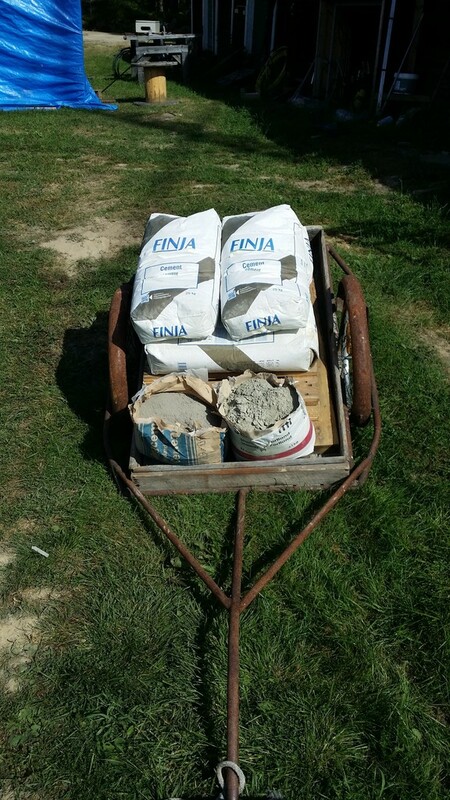 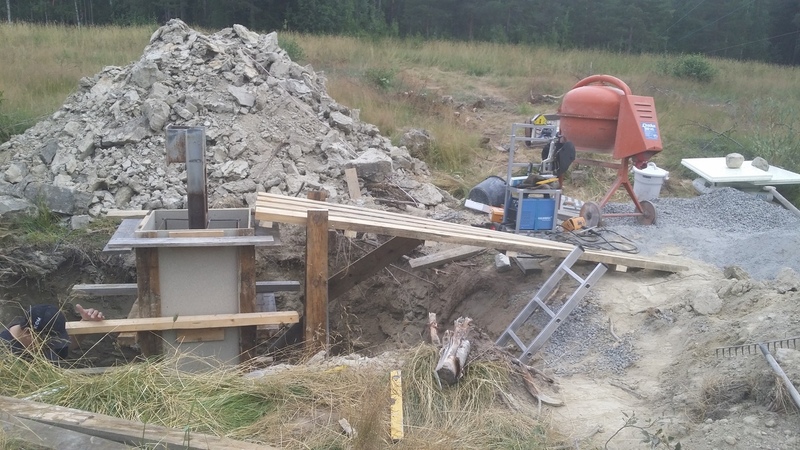 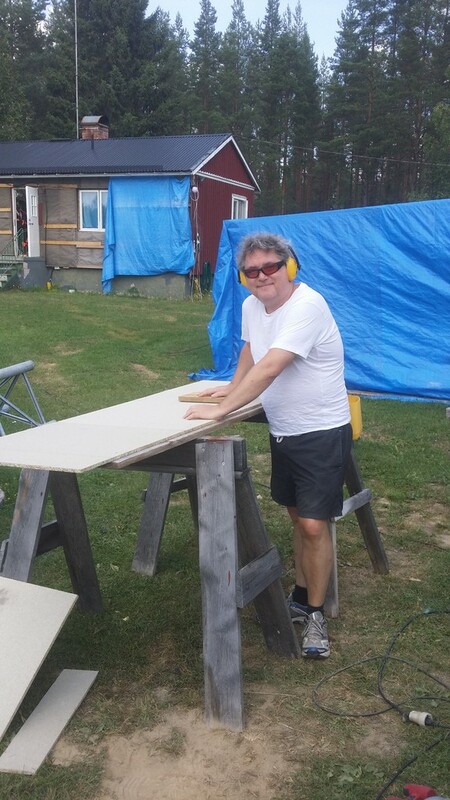 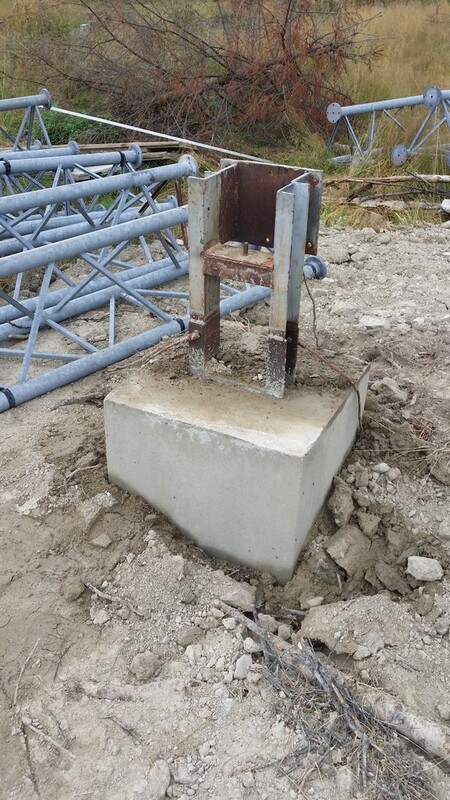 Otherwise I poured the concrete for the “base plate” for the 60m tower. 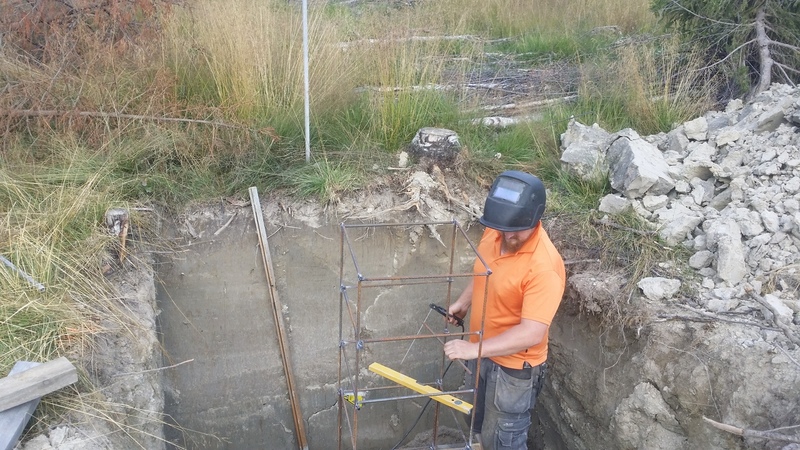 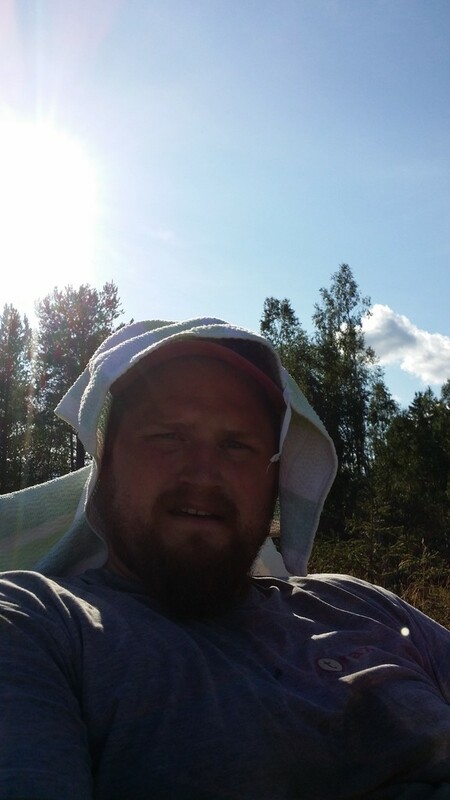 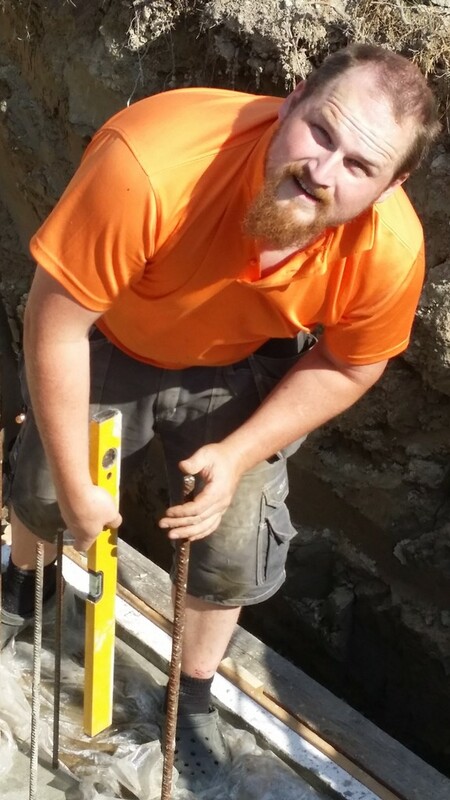 It was very warm, around 28C so it was a real pain but luckily everything went smoothly and keeping the concrete a bit cooler down in the bottom of the hole was not a problem. 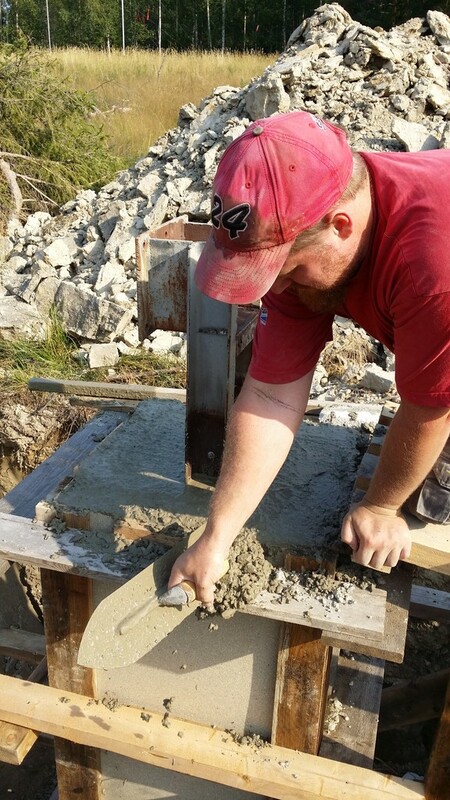 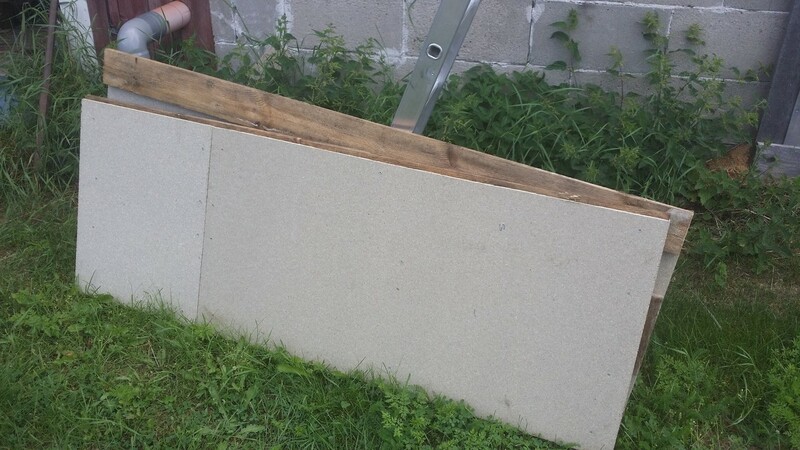 SM2LIY helped me to build the form for the pillar and also a ramp so we could tip the concrete down into the pillar. 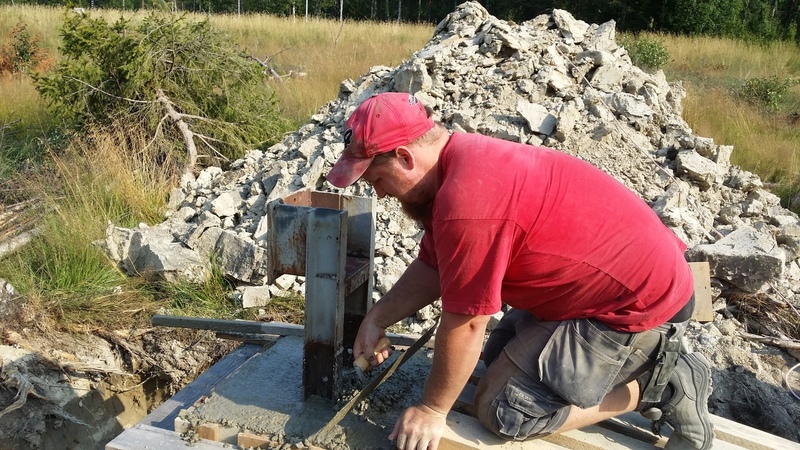 SM2XJP came and helped to put the form together down in the pit and we were ready to mix concrete.